“Ours is the first age in which many thousands of the best-trained individual minds have made it a full-time business to get inside the collective public mind. To get inside in order to manipulate, exploit, control is the object now. And to generate heat not light is the intention. 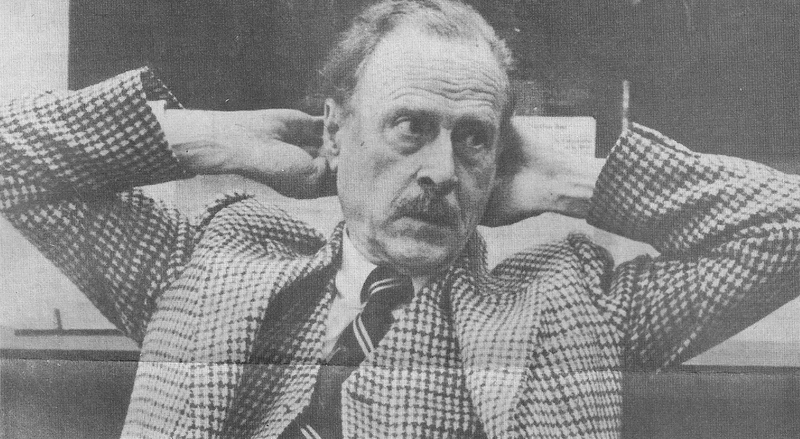 To keep everybody in the helpless state engendered by prolonged mental rutting is the effect of many ads and much entertainment alike.” Opening paragraph of Preface to The Mechanical Bride, Marshall McLuhan, 1951. Personal Aside: However, Brandon isn’t an international city despite its delusions of pretending to be something it isn’t: a big city. 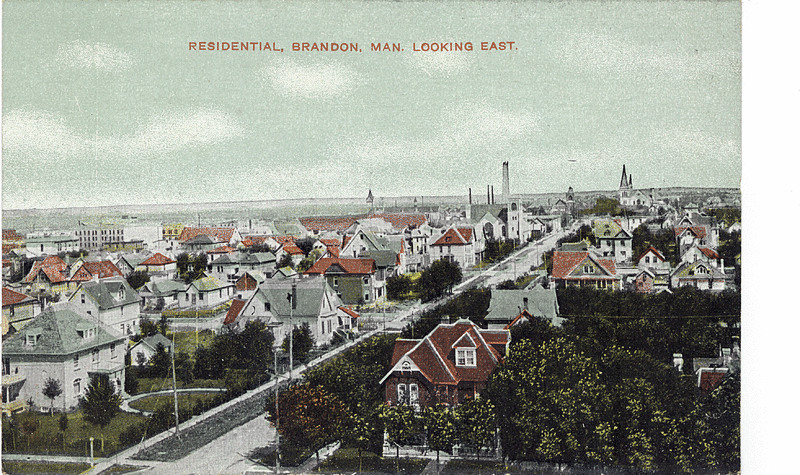 Brandon succumbed to big city woes: a gutted downtown, urban sprawl, congested traffic, homelessness, no-brainers like a shopping mall on a frequent flood plain and the location of their new fire hall between the river and railroad tracks. Urban sprawl is so rampant Brandon should be renamed Mortgage Heights. 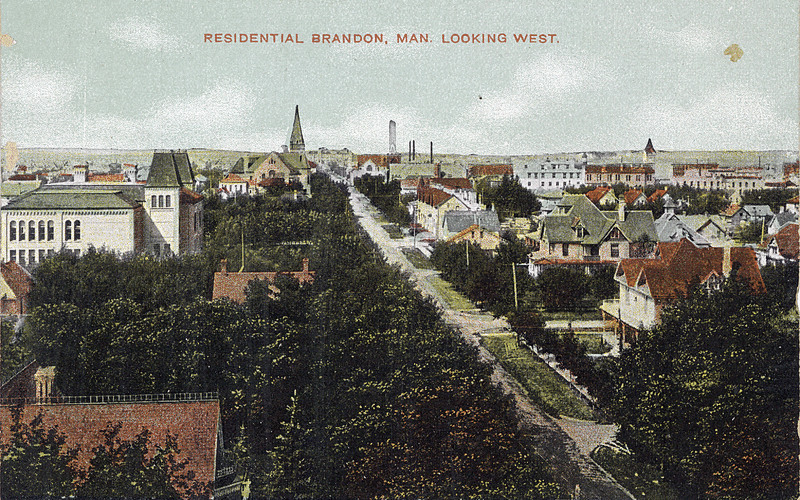 Brandon has lost its identity as a rural hub. Both photographs were taken during McLuhan’s Brandon visit by Stu Philips. 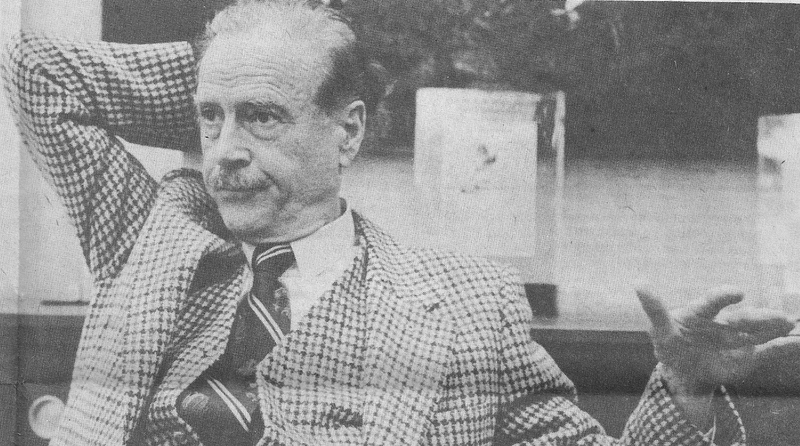 Watch my McLuhan Mash-Up called “Everybody Is With It.” It’s a minute twenty. 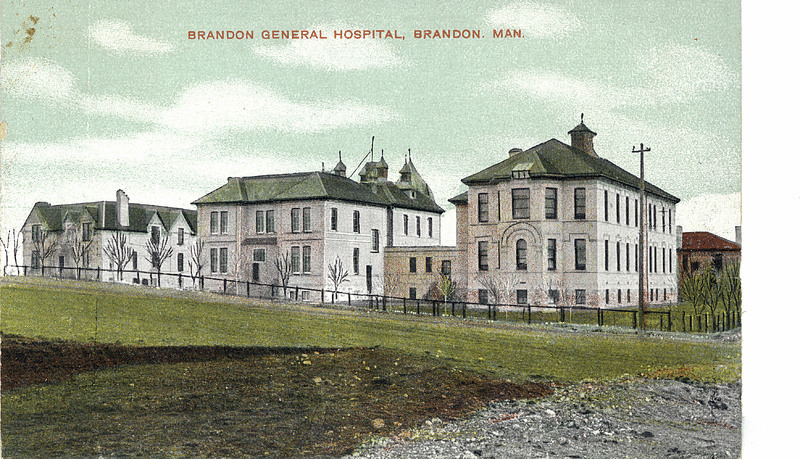 Benjamin Jones Hales came to Manitoba from Ontario and taught at MacGregor and Hartney Schools before becoming the first principal at Brandon Normal School, a job he held from 1911 to 1939. A keen naturalist, his collection became the B. J. Hales Museum of Natural History, a permanent fixture at Brandon University since 1965. 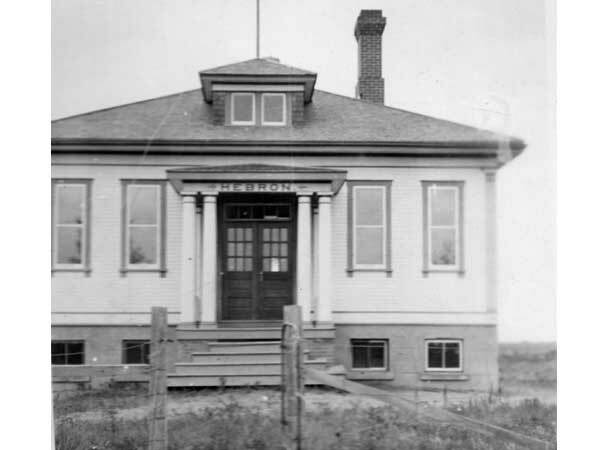 About a block away from Brandon Normal School, one of four such schools for teachers set up in Manitoba, Hales built his house in 1912. 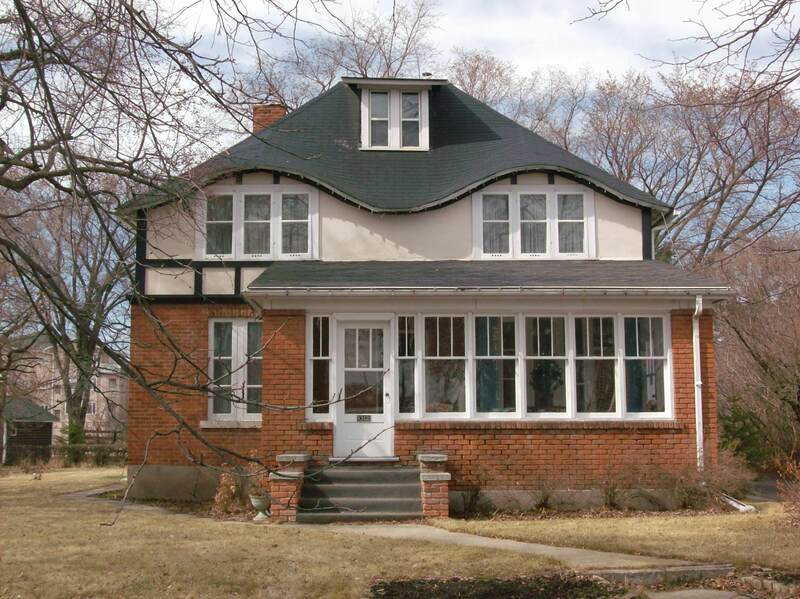 Leaning toward Arts and Crafts but declaring no particular architectural style, it’s the double eyebrow roofline that dominates the house along with its steep hipped and oddly truncated roof and prominent dormer. Set back from the street on a wooded lot, the two and a half storey brick house is domestic, simple, genteel, a model of the times it was built. I love the little second tier sidelights next to the porch door. The lot is partially surrounded by a fieldstone fence with a built-in stone fireplace on the south side. Much of the flora on the property was planted by B. J. Hales. 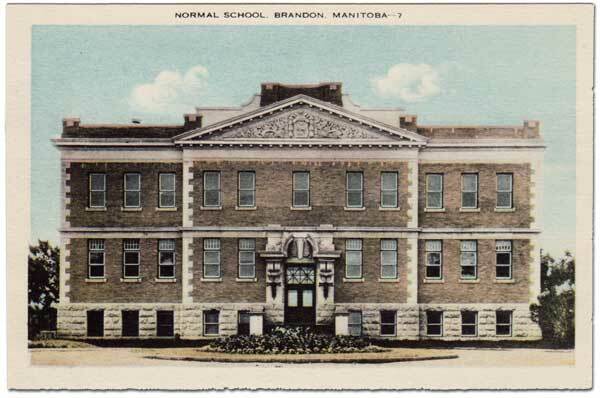 This is a 1930s postcard of Brandon Normal School. prior to 1920, virtually every school textbook in western Canada passed through Christie’s shop. 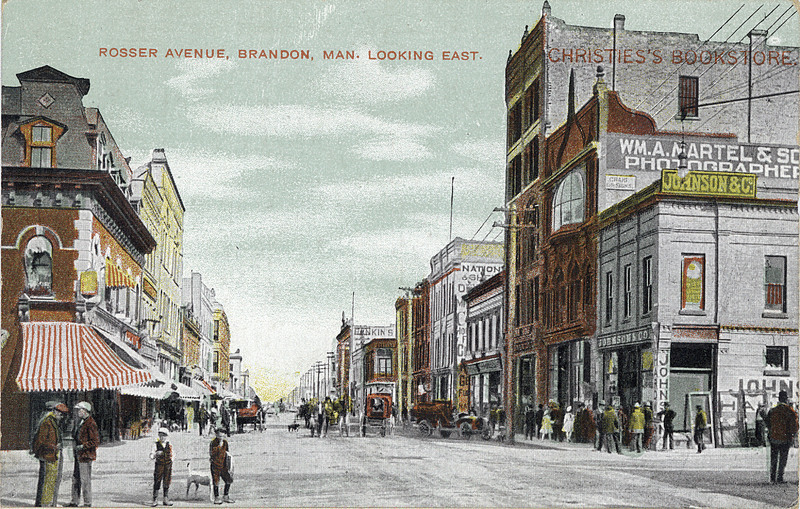 Recently I found an early promotion item created by Christie’s that allows a glimpse of Brandon as it looked a hundred years ago. 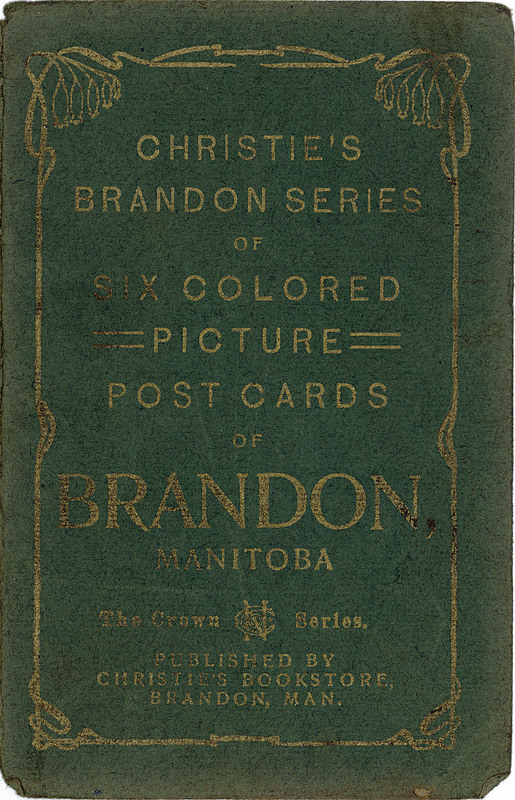 It’s a packet of six postcards with scenes of the city, packaged in a folder with Christie’s name on the front and published about 1910. Each card has a brief description and tinted image. 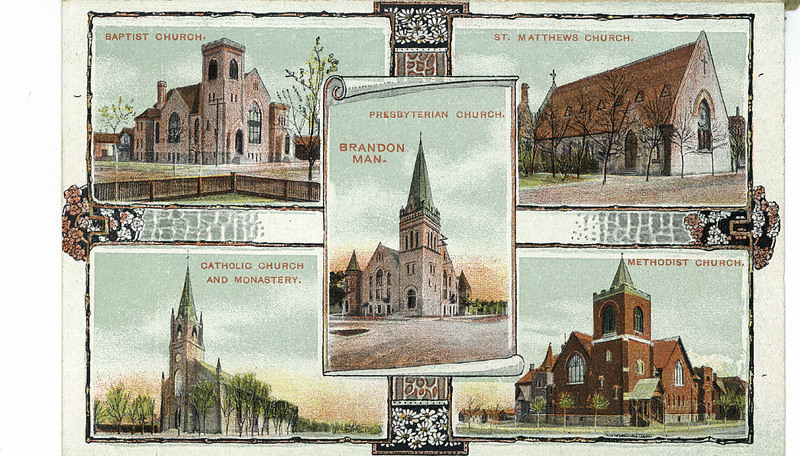 I also came across one other postcard of Brandon churches from the same era. It’s the last image in this nostalgic collection. Please enjoy! Following an alarming decline during the 1950s and 1960s, this spectacular falcon, also called the “Duck Hawk,” is on the increase again, now that DDT and other pesticides that caused thinning of eggshells have been banned. After an intensive program of rearing birds in captivity and releasing them in the wild (a process called “hacking”), this large falcon is reclaiming nesting grounds from which it disappeared a few decades ago. Although their habitat is mainly open country, especially along rivers and coasts and near lakes, a favorite nesting site nowadays is a tall building or bridge in a city. These urban Peregrines subsist mainly on pigeons. Since 1989, pairs of reintroduced Peregrines have nested high atop the Radisson Hotel on Portage Avenue in downtown Winnipeg. Characteristically, Peregrines return regularly to favourite nesting sites. One pair after another has used the same spot in England since 1243. Since 2006, CBC Manitoba has provided a falcon cam in the nest of the downtown birds. Soon the feeding frenzy will begin. Click pic to start live falcon cam. The Peregrine Falcon has been the favourite of falconers for over 3,000 years, ever since the nomads of central Asia first pursued game with trained hawks and falcons. Extremely acute eyesight, even in dim light, allows falcons to be very effective hunters around dawn and dusk. Peregrines often migrate very rapidly between breeding and wintering areas, flying as much as 500 km per day. 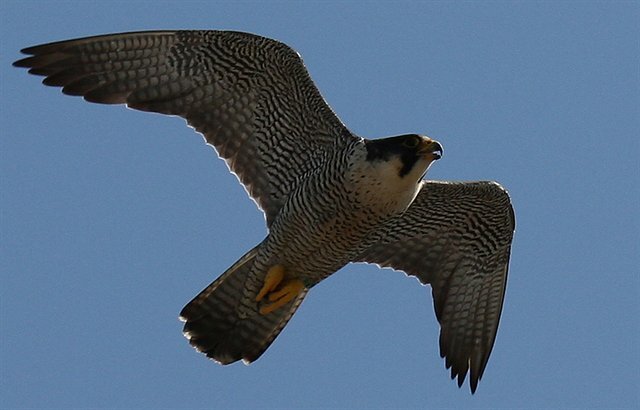 A female Peregrine that nested in Edmonton flew to Mazatlan, Mexico, in less than eight days and returned in six days. 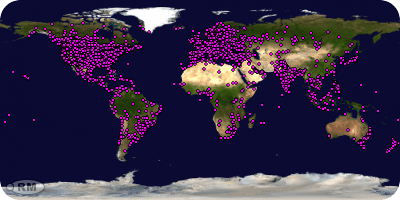 With the exception of Antarctica, New Zealand, and Iceland, the Peregrine is found around the globe. Twenty-two subspecies are recognized throughout the world. 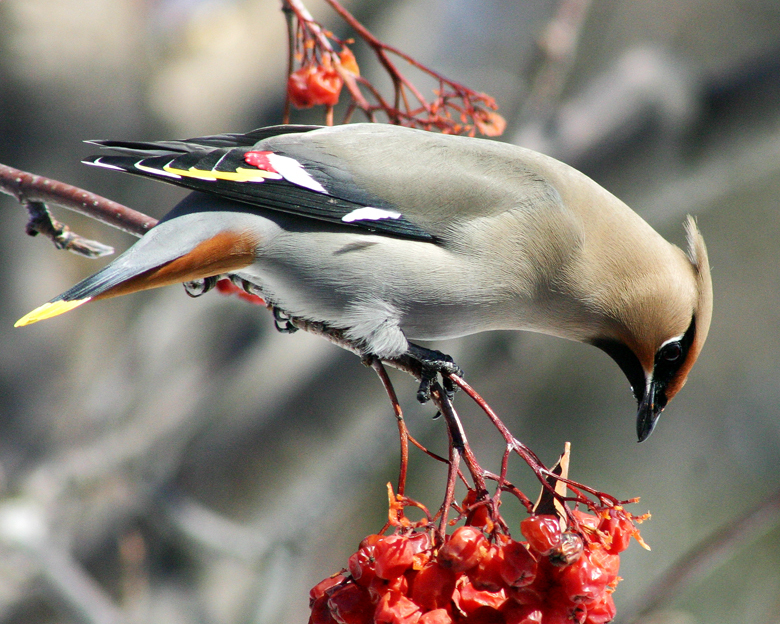 Their great powers of flight have enabled them to establish nesting populations in the Arctic, and as far south as Tasmania, South Africa, and the Falkland Islands. 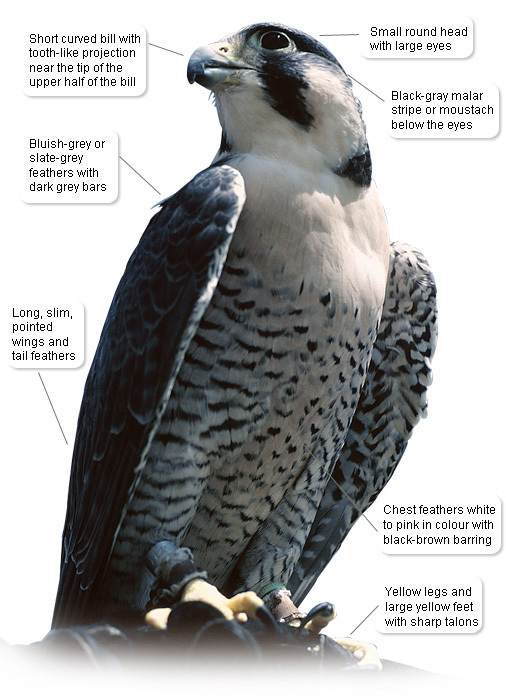 Peregrines breed from Alaska and the Canadian Arctic south locally through the mountainous West, and sparingly in East. Winters coastally, north to British Columbia and Massachusetts. This post can also be found permanently on my Birdland page. Peregrine Falcons Nesting in Brandon, Too! When I posted the first story about the falcons in Winnipeg a few days ago, the Brandon cam wasn’t up and running. Today it is and what a great angle on the future festivities! The nest is situated high atop the McKenzie Seeds Building in downtown Brandon. There are two tabs along the top of the image, one for Winnipeg nest, one for Brandon nest. Click pic for both cams. 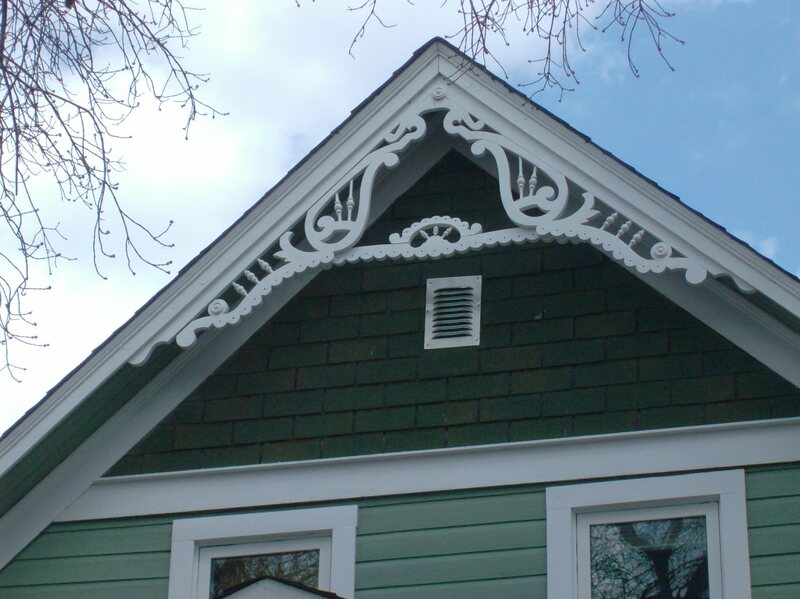 Called bargeboard, or less commonly vergeboard, the gable ends of many Queen Anne Revival houses built in Canada sported these elaborately carved, ornate Carpenter Gothic details. Brandon has a fine example of Eastlake Stick style – the Paterson/Matheson House at 1039 Louise Ave. My post about this house is on my Houses page. Before apartment blocks became the norm for dense urban housing, row houses or terraces served a similar purpose. Originating in Europe in the 16th century, a row of identical or mirror-image houses that shared side walls made more efficient use of city land than detached houses. 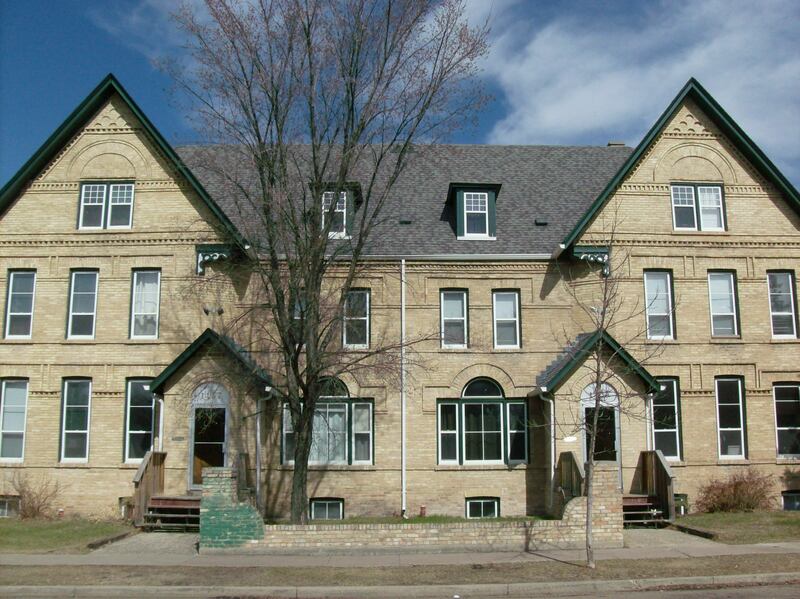 Row houses spread around the world and an excellent example can be found in downtown Brandon, MB. 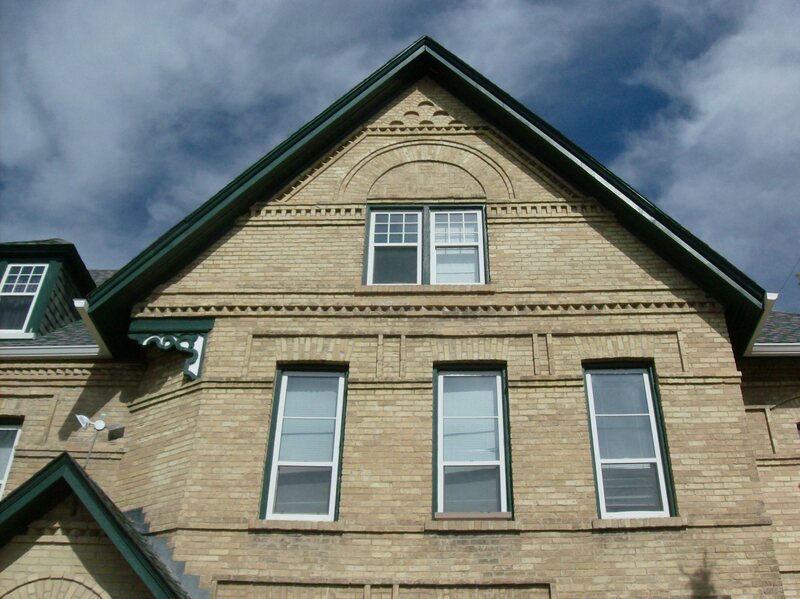 Located at the corner of Lorne Avenue and 11th Street, Lorne Terrace was built in 1892 and originally divided into four separate and quite luxurious, for the time, units. Today the terrace has 14 apartments. Lorne Terrace was built by Bell Brothers Construction Company which had a reputation for top-quality materials and workmanship and attention to detail. 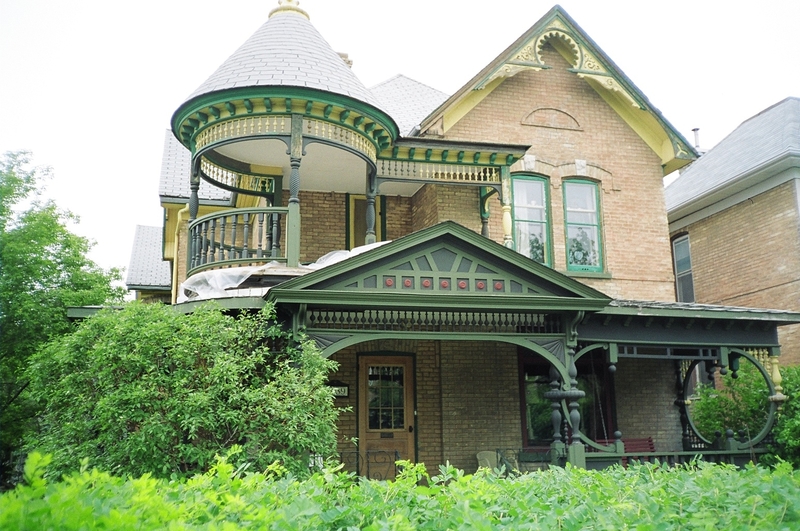 Over four decades, Bell Brothers constructed many notable buildings in Brandon, some of which are now precious heritage sites. The Terrace is one of them. The first thing that strikes you about Lorne Terrace is its substantial rectangular massing in fine buff brick laid in standard running bond with a medium-pitch hipped roof, cross gables on the front and rear and hipped dormers on all sides. Now drink in the symmetry of the front facade. The pair of entrances feature identical gabled porches and arched hood moulds that replicate the ones under the third floor gable peaks. The fenestration offers a variety of openings: singles, pairs and trios of windows abound including the two lovely Palladian-style openings on the main floor between the entrances, both with raised brick hood moulds. The craftsmanship of the brick detailing on the terrace is exceptional. Study the brickwork below each gable and you will discover an array of stylings from dog-toothing where the corners of the bricks protrude, to soldier, sailor and rowlock courses to a basket weave pattern right above the paired windows with blind arches and hood moulds highlighting the opening. 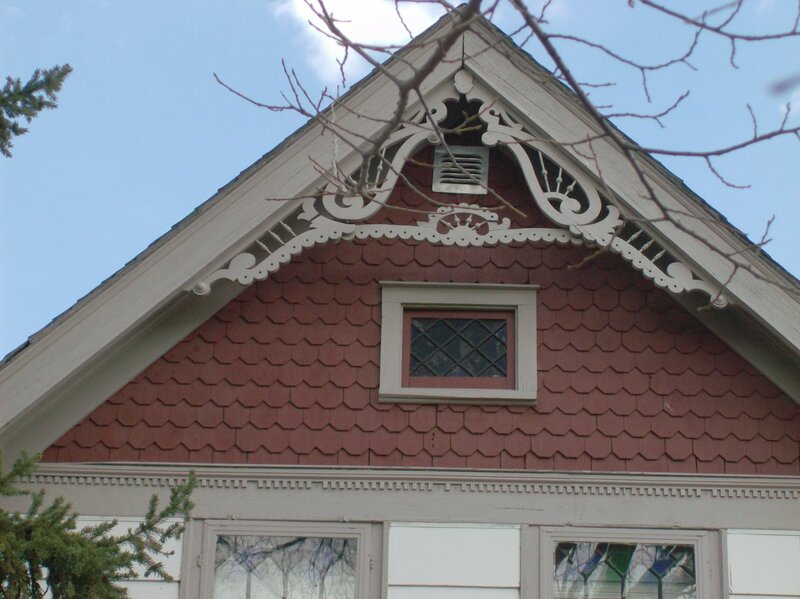 In this picture you can also see the painted wooden bracket with a bit of scrollwork on the inside corner of the front gable. 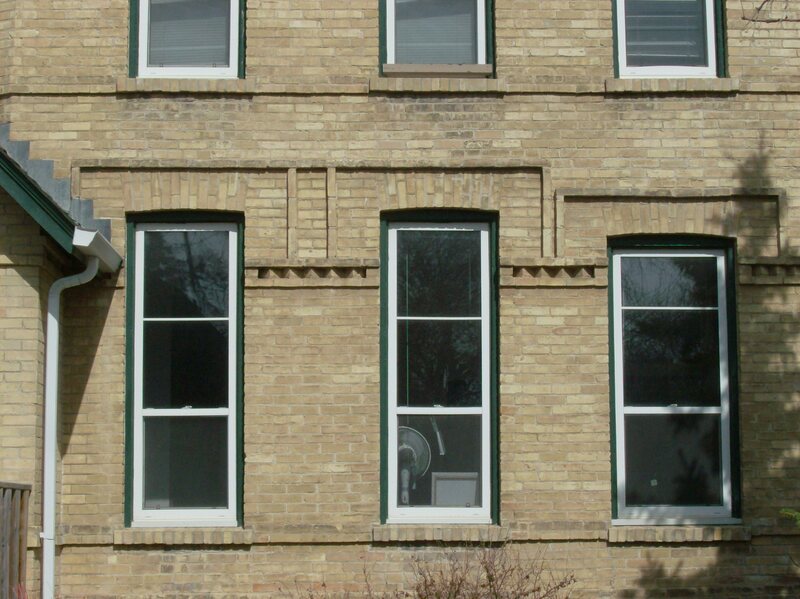 Several raised brick stringcourses, including the sills, wrap around the building. The municipal building for the RM of Pipestone is a beauty! 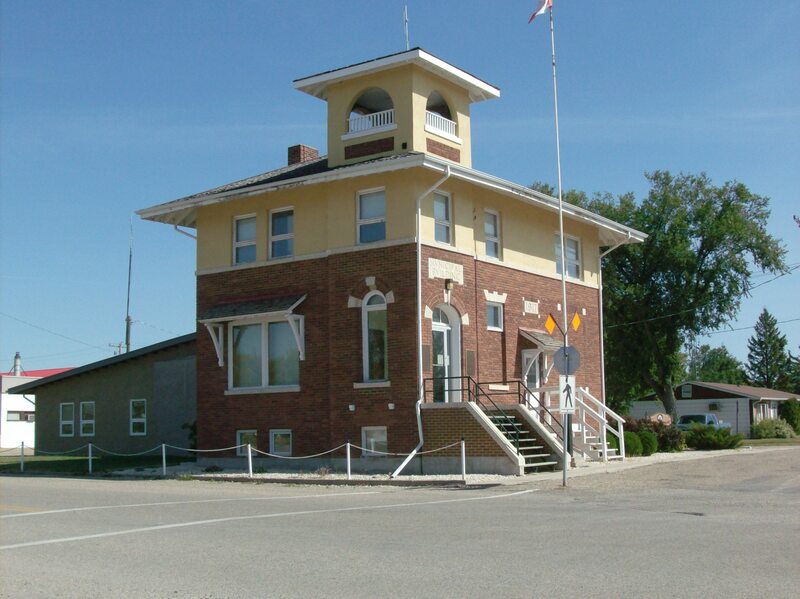 Located on a prominent corner in Reston, MB, it is a rare example of Italianate style used on a public building. The style, popular at the turn of the 20th century, was employed mainly on houses, rarely for civic structures. Built in 1917, Brandon architect William Alexander Elliott designed this elegant, compact two-storey place, which features many Italianate elements including low-pitched rooflines, wide eaves, tall windows and the small corner tower. The main entrance on the building’s south side has a rounded brick arch with stone highlights. The secondary entrance is simpler with a shed roof. The windows are a variety of shapes and sizes with the slim arched window on the west side complementing the main entrance beautifully. There is playful contrast between the striking red tapestry brick and the light coloured second floor and tower and white trim. 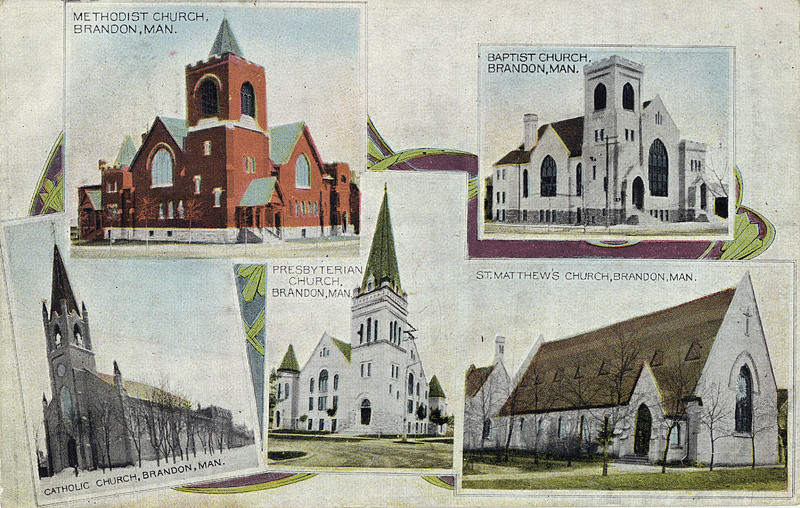 One of southwestern Manitoba’s most prolific architects, W. A. Elliot’s buildings include Park School, Brandon 1904 (demolished), Hamilton Hotel, Neepawa 1904 (burned), Bank of Montreal, Brandon 1905, Clark Hall, Brandon University 1906, Empire Bottling Company bottling house/warehouse, Brandon 1906, Brandon Collegiate Institute 1907, Methodist Church, now Dutch Christian Reform, Brandon 1909, Carberry Town Hall 1909, Cecil Hotel, Brandon 1910 (burned 1981), Central Fire Station, Brandon 1911, Opera House, Virden 1911, St Matthew’s Anglican Cathedral, Brandon 1912, Methodist Church, now St Paul’s United, Souris 1908. 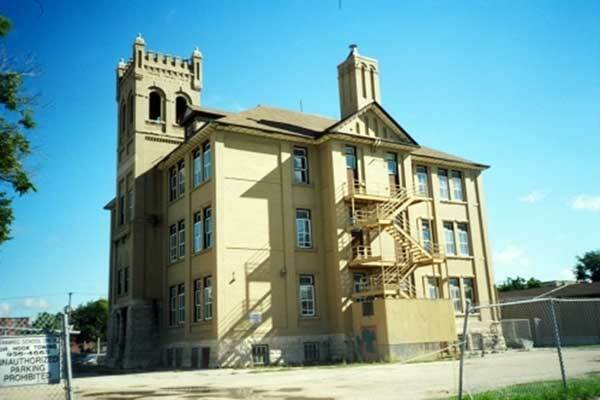 Elliot also created design plans for over 40 public schools built before WWI in Manitoba towns like Baldur, Newdale, Elkhorn, Melita, Brookdale, Rivers, Oak River, Rapid City and Reston. He also designed buildings for numerous Saskatchewan towns and cities including Moose Jaw and Arcola. 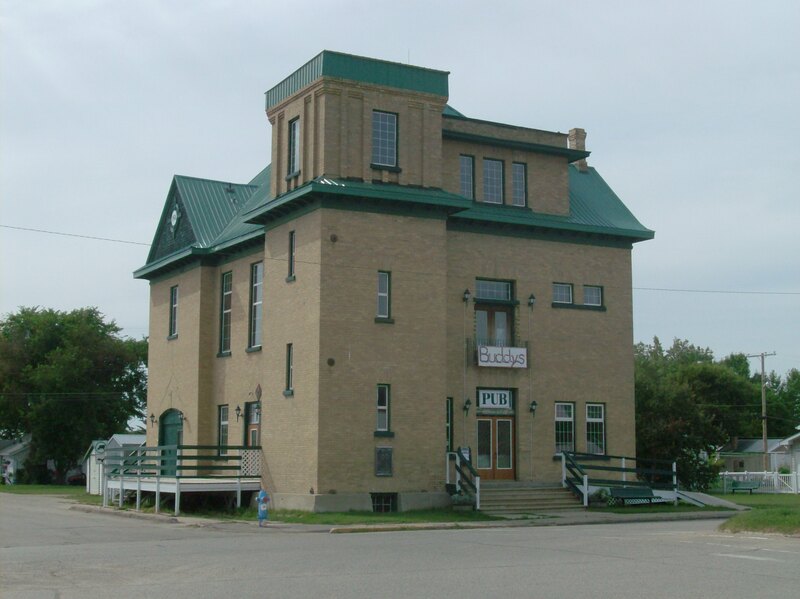 Now Buddy’s Pub, this was Arcola, SK’s town hall designed by Elliot and built in 1905. Though I was home schooled early by my teacher mother, my formal education began in Hebron School, a one-room schoolhouse. This sounds like a pioneer situation but it was actually the 1950s. 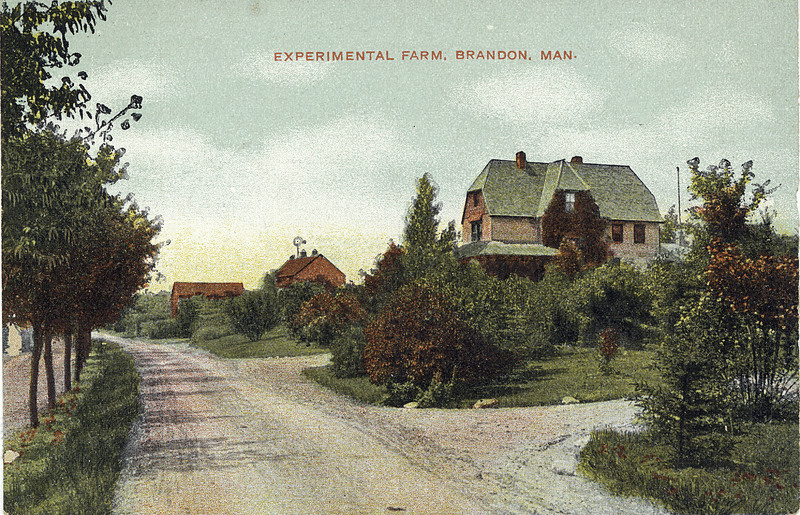 The area south of Brandon had plenty of young farm families at the time. Dad and Mom along with several neighbours with school-aged children petitioned the provincial education department to reopen Hebron School. With the baby boom in full bloom, the province agreed with the local wisdom of using an old one-room school to help educate the population surge. 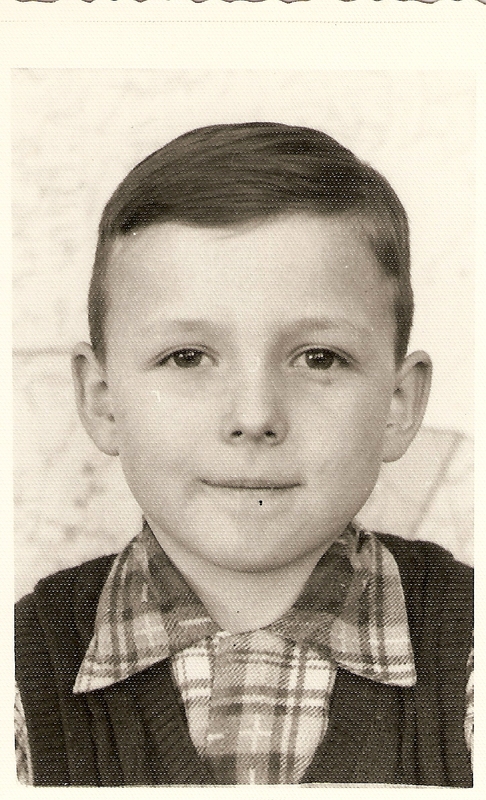 The school reopened in 1955, the year I attended Grade One. Hebron School sat at the intersection of two gravel grid roads, three miles from Hayfield, one west, one south, one west. 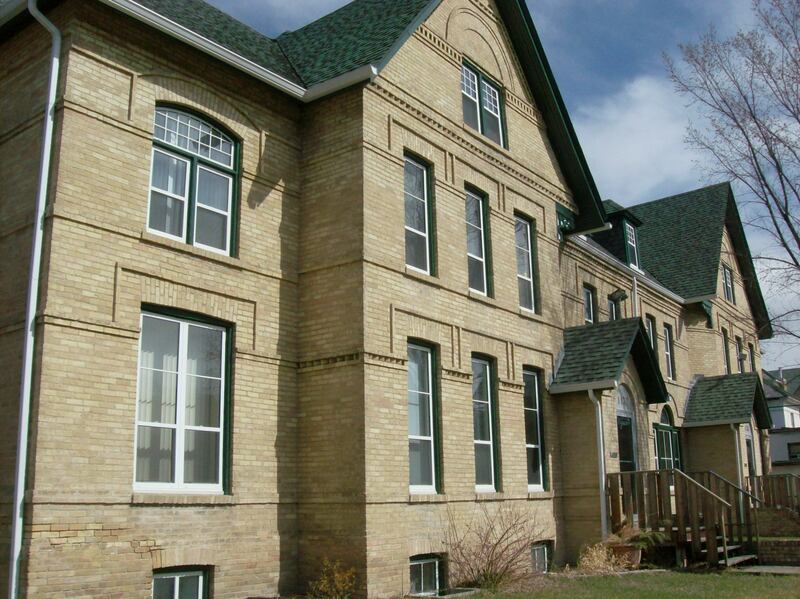 Between 1903 and 1918, the building of one-room schools flourished all over Manitoba. About 400 new schools were built over that 15-year span bringing the total number of one-rooms in Manitoba to 1,400. Built about 1910, Hebron School was a traditional one-room country schoolhouse, wood frame with a pyramid roof and a low dormer above the front entrance. The doorway sported a small porch with modest Classical Revival stylings in the form of a pediment supported by columns. Almost square with a small cloakroom at the entrance and a little office for the teacher on the west side, the rest was the classroom with blackboards around two sides and a row of large windows facing east. A flagpole flew the Union Jack. The school’s amenities included a small stable out back where you could tie up your pony or mule for the day while you went to school, and a manual pump for water. In the spring and fall, I rode my little two-wheel bicycle to school. About 30 pupils demanded the attention and wisdom of Miss Bernice McRae, a young local woman fresh out of Normal School. During the school day, Miss McRae moved from the large Grade One row to the much shorter Grade Eight row, giving each her own special attention, their lessons and the direction their attentions needed to go. I learned everyone’s lessons in one year. It was impossible not to, a bright, curious child getting eight years of knowledge at once! It was school immersion. I attended Hebron until the middle of Grade Three. Every year the School held a Christmas pageant that disrupted the room completely because the stage, built on wooden trestles, took up a third of the classroom. The show consisted of the familiar songs, drills, costumes, the usual Christmas trappings all cute as the dickens when done by little kids, your little kids! I “sang” and “acted” in the nativity play, usually as a shepherd. Hebron School had a basement, which meant it had a furnace that kept it relatively warm most of the winter. On the coldest days, we lit an extra stove on the classroom. When Miss MacRae noticed black clouds streaked with lightning building in, she’d herd us all into the cement basement of the building to wait out the storm in safety. I recall the sound of the daily attendance binder she kept as she snapped it shut after taking attendance as we entered the basement. I suppose she brought it to account for her small brood of charges should we be hurled into oblivion or taken to heaven by a twister. Like Hayfield, Hebron School no longer exists. Sold and moved off the original site in the 1990s, its corner of the world has turned into cropland. Often unused schools became granaries, shops or sheds but I’m not sure of the eventual fate of Hebron School. A stone with a commemorative plaque marks the spot where the school stood. Though I excelled in terms of the requirements of Miss MacRae and Hebron School, and despite school immersion, in Shoal Lake Grade Three, I was behind. I couldn’t multiple or divide for my level. Before and during Christmas, while I recuperated from an accident, Mom taught me math at the kitchen table. Dad would come home from work and we’d report how the multiplication was going, complete with demonstrations. “Six times nine,” Dad would say and I would spout out the answer. I caught up. In addition to the plaqued rock, there is one other reminder of Hebron. 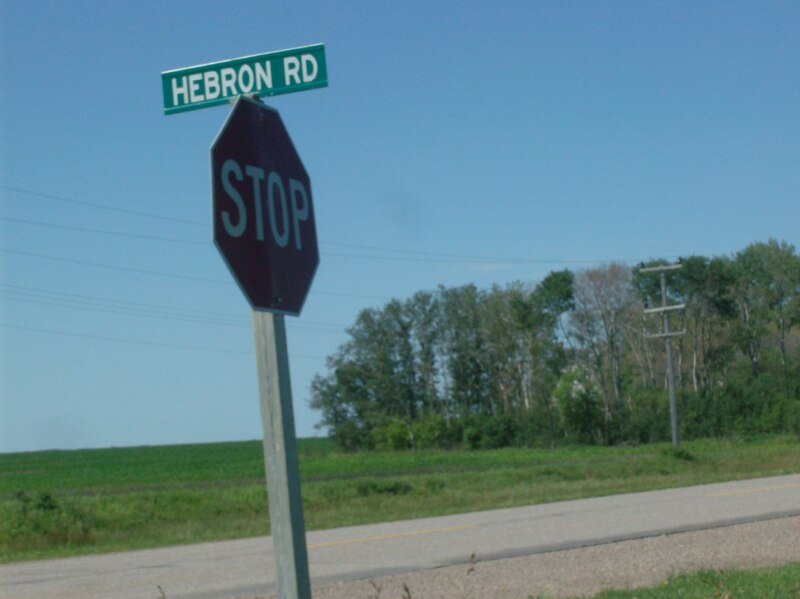 Hebron Road, a good gravel road, runs off Hwy 2 east of Souris and goes right by the former school site. This article about Hayfield along with a store picture was supplied to the Souris and Glenwood Municipality history book, published in 2006. 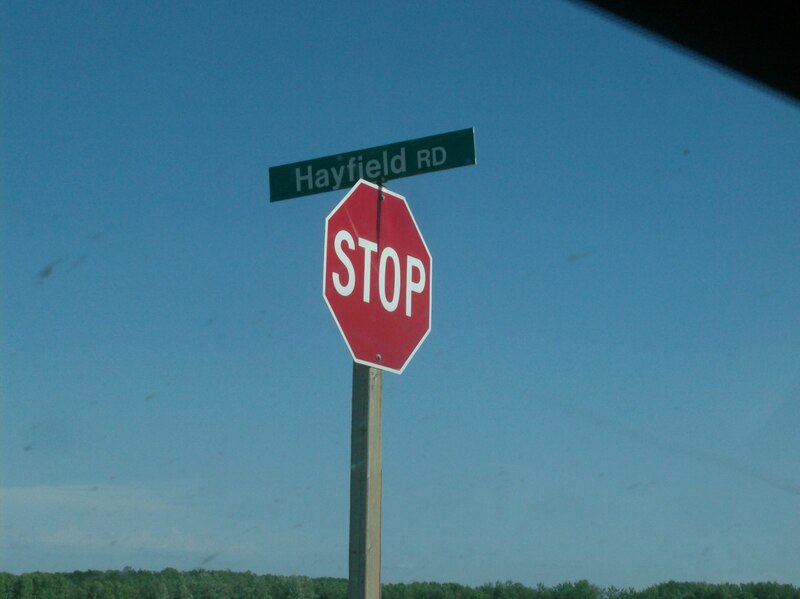 I may be the last person alive who ever lived in Hayfield, Manitoba. My parents (Bruce and Helen Dickie) and I moved from Margaret, Manitoba in 1952 when they purchased the Red and White store in Hayfield. I was three years old. 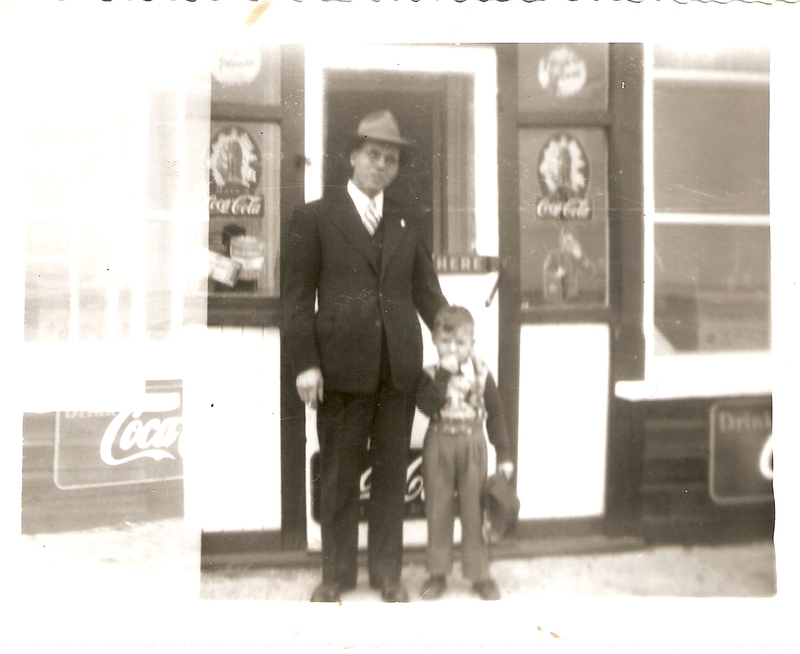 Dad bought grain in Margaret for Pool Elevators after he returned from the war and wanted a new experience. Hayfield provides my earliest firm memories. The country general store my parents bought was a huge two-story rectangular building with shed-roof wings, slat siding and Red and White Store emblazoned across the front. We bought the buildings, not the name, from Mrs. Canning after Mr. Canning passed away. Thereafter it became Dickie’s General Store though the white with red trim remained. As you came over the rise traveling west on Hayfield Road, the store, blazing white in the bright sun, stood against a rolling landscape of crop and fallow making it impossible to miss. Front view of Dickie’s General Store in Hayfield. Note the handpump-style gas bowser. The child in the picture is me. The store, which faced east, had a flat roof and façade with a central entrance and sidelights bracketed by two large multi-paned display windows. The sidelights sported large Coca-Cola decals. On the façade a pair of narrow rectangular windows opened into the second floor. The wing on the south housed vehicles, the one on the north a storage area with its own entrance. A windbreak of trees to the north and west of the store helped protect it from inclement weather. Don’t mistake Hayfield for a town or even a village. It was mostly just a store. Besides my parents and me, just two others resided in Hayfield: the hired man, Lawrence Murphy who rented a room from us and an older man named Dave Rogers who lived in the only remaining house in Hayfield. More cats and dogs than people lived in Hayfield. On the main floor, our store sold groceries, dry goods, house wares and a few farm supplies. A soft drink cooler – the kind with a tank of cold moving water holding drinks like Kik Cola, Wynola, cream soda and a myriad of Stubby flavours – stood next to the front door. Customers came in from the summer heat, opened the large lid of the cooler and either poured over the vast variety of drinks or reached right for their brand, likely Cokes all clustered together. I accumulated a huge bottle cap collection from the sticky catch bin of the cooler. At the rear of the store, a post office offered the services of the Royal Mail. Mom was the postmistress and Dad delivered the mail to the local farms. In winter, he drove a horse and cutter, in summer he used a half-ton. 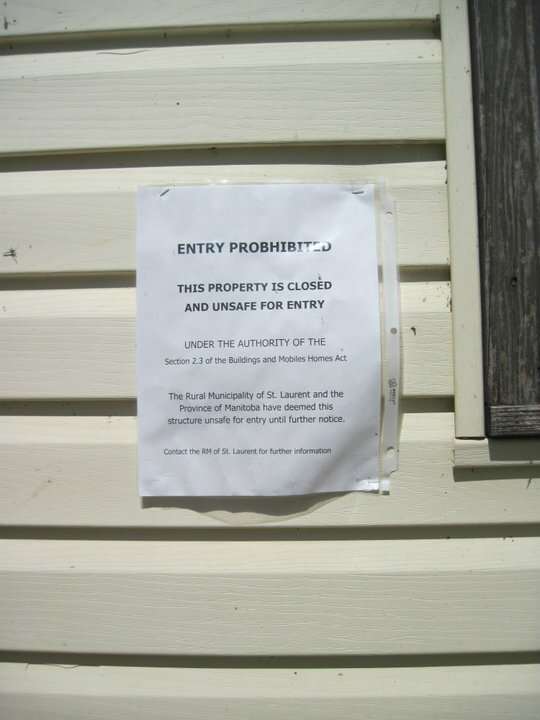 The post office was the only place off limits to me, federal property and all – there and Lawrence Murphy’s room upstairs in the corner, personal property and all. Oiled wooden planks, likely original to the place, covered the floor of the store. I recall the slightly chemical smell of the crumbly green stuff we put on the floor before we swept it. In front of the store in the parking lot was an Esso gas bowser, the kind with the glass tank overhead into which you hand-pumped with a handle the required number of gallons then gravity pulled it into the tank. We lived at the back and above the store. Behind the store were our kitchen, family room and mudroom. A crude summer room led off the kitchen. Our bedrooms were upstairs, my parents in the front corner, Lawrence’s in the opposite back corner, mine along side Mom and Dad’s. These bedrooms all opened into a huge living room with linoleum floor and four wood frame windows across the south side We never had much in the way of furniture up there (our financial situation was modest at best) so I rode my tricycle around and around in the bright airy empty room. In one upstairs corner down a short hallway, a dusty storage room housed an enchanting assortment of things from the store’s past. A moveable type printing press, in pieces but with the type open and available to my little fingers sat next to store displays for products that hadn’t been made in decades and a few personal effects of families who lived there before us. I’m not sure why but my parents completely ignored this room and its contents. It became my secret place. The mysterious and intriguing thing that turned the storage room into a secret place was not left behind by a person. On the sill of a west window, I found the perfectly preserved skeleton of a mouse, bleached white by the sun. It provided my first exposure to death encountered suddenly in an unexpected place. I remember how the sheer brightness of the tiny bones reached out and grasped my attention, how I would stand and stare at the glowing white structure, arranged like jewelry on the grey wooden ledge, the sun pointing slanty fingers through the slowly moving dust. My young imagination strained to picture those frail dry bones supporting a tiny body in a soft fur coat, tail sweeping back and forth, warm life pulsing inside. Over the years, I watched these fragile bones turn to a soft white powder. 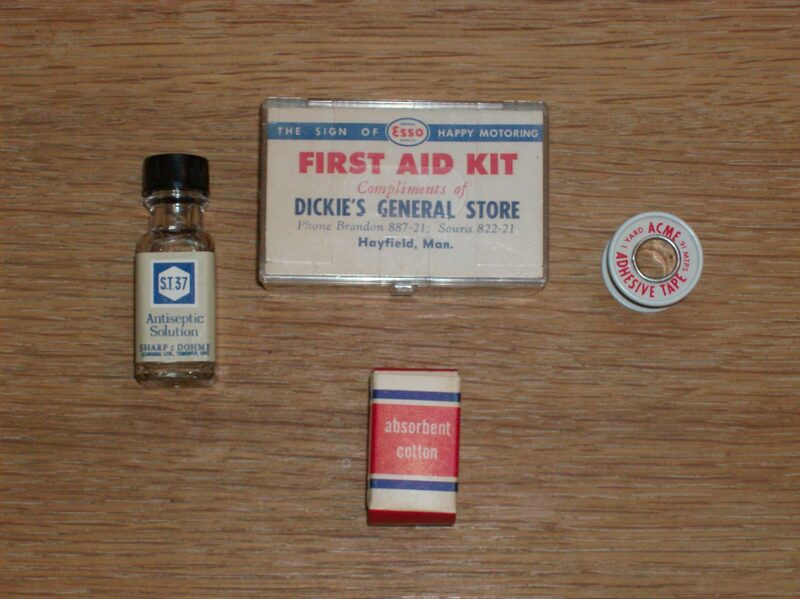 This promotional item from Dickie’s General Store is a small first aid kit in a plastic box containing an antiseptic solution, cotton absorbent, a spool of tape and basic first aid instructions. By the time we arrived in Hayfield, only a short section of the raised grade across the prairie remained to remind you that railway tracks once ran through here. At some point Hayfield had at least one elevator but all that remained of it was a metal grain bin set deep into the ground, its shiny slanted metal sides gaping and open to the sky, a great danger to anything that fell into it. It usually held enough water in the bottom of the hopper to drown a child, a constant worry to my parents. I recall Mom’s frequent warnings not to go near the hopper. It was the most dangerous thing I ever encountered in Hayfield. North of the wooden store, two small sheds and a barn, all with gable ends, sat next to a corral. The last building in the row, a big wooden hall, provided me with endless hours of amusement. (This was formerly the Hayfield church.) The hall consisted of a large room with rectangular windows along both sides and an open raised stage at one end. Used for storing lumber, the place was full of planks in piles. I found some old drums left behind by a band that made music there at some previous time. The skins were broken but I can recall standing on the stage all alone banging on the drums with a stick singing at the top of my lungs to my captive audience of old planks. Being an only child in a rural setting without nearby children, I became a self-amusing kid, my performances to old lumber an example. I roamed the area with our black lab, Jet. Mom could always tell my whereabouts because she’d see Jet’s black tail above the tall grass or crop and know her son was safe. Cats abounded in Hayfield. I recall one rainy day racing back and forth from barn to house excitedly reporting every new kitten our cat Freckles produced. A few barn cats tried to keep the mouse population under control. Southwest of the store, a dilapidated wooden fence encircled a space for an ice rink in winter, another hint of Hayfield’s past. Unused by the time we arrived, Dad would cover a small section of the rink with water, clean off a smooth patch with a rusty old ice scraper and let me skate. I learned to skate on this bumpy ice by pushing a small kitchen chair ahead of me. In summer, wild windstorms swept in from the northwest or, more scarily, from the east. Dust devils as big as funnel clouds came swirling across the black summer fallow, lifting cones of dry dust into the heat. 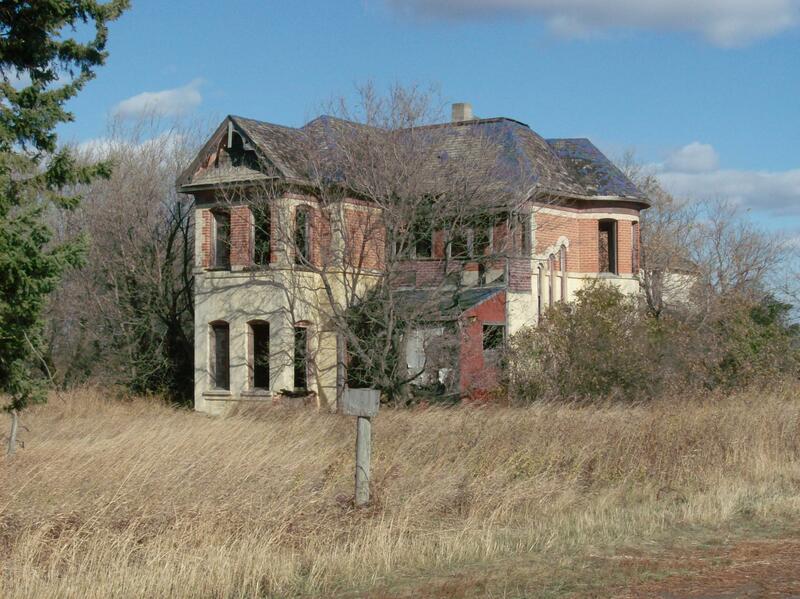 The wind would pop out a pane of old glass in the upper floor of the store, sweep through the place looking for egress, punch out a window in the back room downstairs and continue its desperate journey across the prairie. I have jumbled, frightening recollections of the wind and thunder pounding outside while we frantically held pillows to the windows on the storm side of the house. On more than one occasion, the weather became our enemy, vulnerable as we were out there. Dickie’s General Store would be the last store in the old building. Newly mobile, people found Brandon nearby, alluring and centralized. Our country store was obsolete. In the fall of 1957, we held an auction sale liquidating the stock. Dad found a job running a Texaco consignee business delivering bulk gas and fuel oil to service stations, farms and homes in and around Shoal Lake, Manitoba out on Highway 16. He moved there first and we followed a month or two later. I don’t know the arrangement but Lawrence Murphy stayed on as caretaker of the Hayfield buildings. He may have run the post office for a few more years after we left. Later Lawrence lived in Souris. The store and all the remaining buildings in Hayfield came to a sad but useful end in the 1990s when firefighters in training from Brandon and Souris used them for practice. They set the buildings on fire then put them out, set them on fire then put them out, and so on until they were gone. It brought a tear to Dad’s eye when I told him the details of Hayfield’s demise but we agreed the cause was worthy and a fitting finale. Helen Dickie passed away in 1993, Bruce in 2001. They lie side-by-side in Shoal Lake Cemetery. 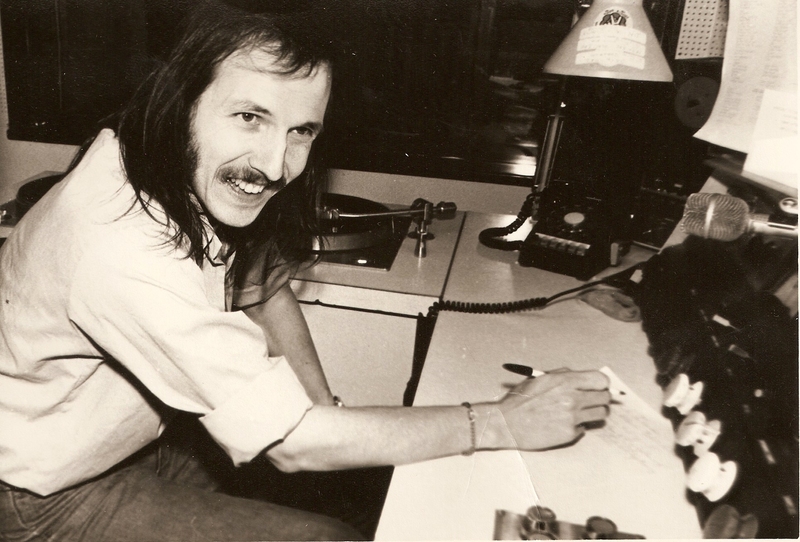 I make a living as a freelance writer, working out of Winnipeg although since my wife Linda passed away, I am trying to retire. My areas of interest include urban and rural architecture, history, heritage issues, music and spirituality. 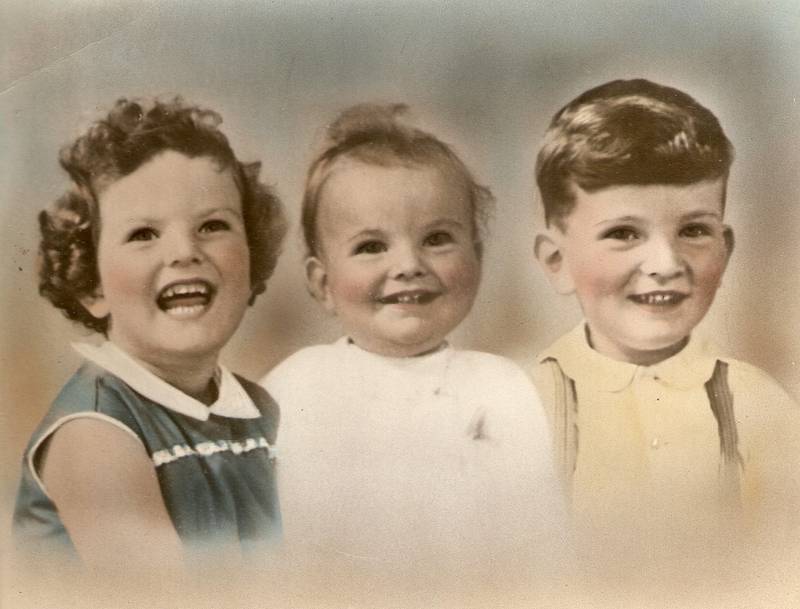 My years in Hayfield, ages three to eight, were formative in my life and in the world. Humanity emerged out of the darkness of a great war into a time of sunny optimism when hope invaded our hearts and souls. The future glowed with promise and prosperity. Somehow, that sense of optimism filtered through to our little family and gave us the strength we needed to move and survive in a new town. Though I consider Shoal Lake my hometown, Hayfield, Hebron School and the Brandon Hills left indelible impressions. That was where the mysteries of life and death revealed themselves to me in obvious and subtle ways, where I learned lessons that are still useful and relevant to me every day. Hayfield is gone but I expect its lessons will last a lifetime. A bluff of trees in a cow pasture and the grade of the lane suggest Hayfield but its only a suggestion against the big prairie sky. Hayfield, Manitoba no longer exists. It’s gone, expunged, vanished. Located 10 miles south of Brandon on Highway #10 and 4 miles west on Hayfield Road, Hayfield sat at the western edge of the Brandon Hills just as the hills begin their final smoothing into farmland. Hayfield was west of the enormous broadcasting tower near the eastern edge of the Rural Municipality of Glenwood. An article in a September 1906 issue of the Souris Plaindealer stated, “Hayfield is to be the name of the new town on the Brandon Saskatchewan and Hudson Bay Railway, northwest of Carroll. A. Wilson will be the pioneer merchant of the future city, having decided to establish a branch store this fall.” Despite the best efforts of all the storekeepers and area residents, the City of Hayfield was not to be. An early picture of Hayfield with the store on left, then barn and church. The railway station is obscured by smoke from the locomotive but the water tower is visible behind the train. The elevator was on the left out of the picture. The original store was built on the future site of Hayfield even before the railroad tracks were laid. In 1906, A. Wilson and his sons, Guy and Red, built the two-storey wood frame store. With the arrival of the Great Northern Railroad (the subsequent name of the BS & HB Railway), Hayfield began to grow. The store, which included a post office, did a thriving business. 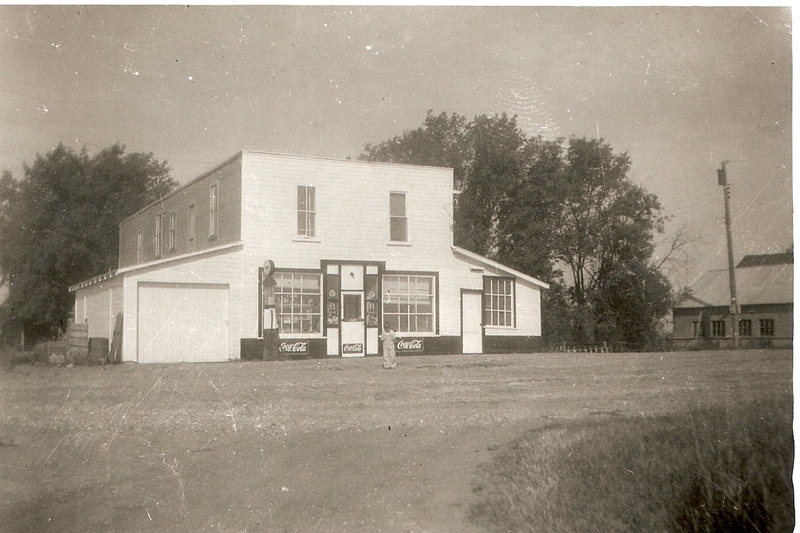 Over the years, Hayfield General Store became an important meeting place for the community. With the store open from morning til night, neighbours visited while shopping, discussing issues of the day. Besides groceries, hardware and dry goods, you could have a sundae in its ice cream parlour. My father used to call the men who sometimes gathered at the store in the evenings the Hot Stove League, no doubt due to their vast wisdom and willingness to share it. The Great Northern Railroad built a station at Hayfield in 1907. The busiest place in the community after the general store, the railroad station served residents and visitors for 22 years before being relocated to the place known as “The Diamond,” three miles west of Carroll. This was where the Canadian Pacific and Great Northern Railroads’ tracks crossed. Here it was known as Griffin Station and continued to operate until 1933. Station agents at Hayfield over the years included Bill Lauterwasser, Mr. Henderson, Glen Carter, Gordon Maxwell, Mr. Lenarz and Bill Oty. Hayfield was one of the water stops for steam locomotives. A water tower was built north of the station and water was piped in from a spring located a mile to the north. GNR built two residences at Hayfield for company section men and their families. 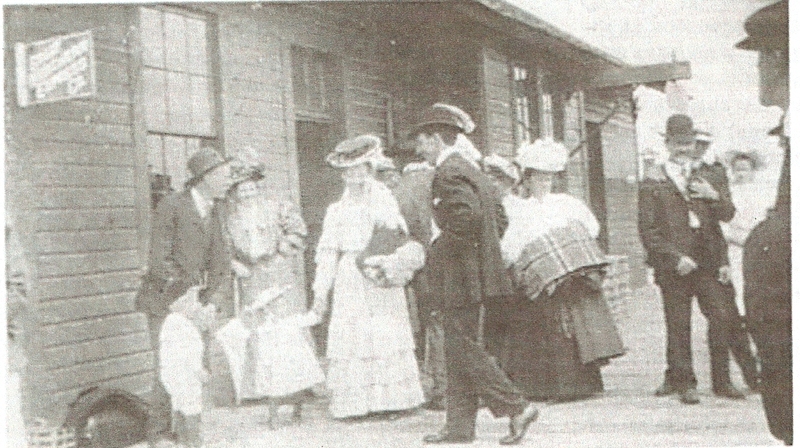 Bustling Hayfield Railway Station in 1908 alive with prim and proper children, ladies in picture hats and gents in bowlers. The McCabe Grain Company began construction of their Hayfield elevator in the fall of 1906 but a severe winter delayed completion until the spring of 1907. The company placed railcars on the siding in the fall of 1906 so farmers could deliver their grain but it didn’t move until the following spring. The McCabe Grain Company supplied a residence for its Hayfield elevator agents. 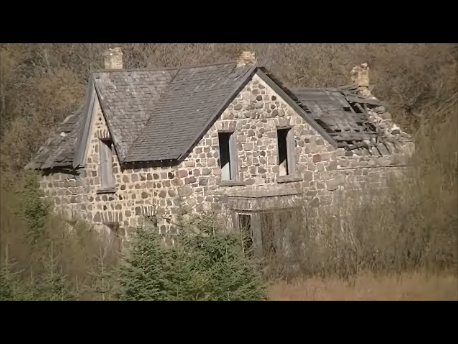 That house was later moved to Carroll then to east of Log Cabin as a private residence for the Flickwert family. The elevator continued serving the area until the railroad ceased to operate. McCabe closed the elevator in 1935 and tore it down the following year. Some of the material was used to build the Newstead Elevator, which operated until 1982 and was demolished in 1986. Some of the agents who ran the McCabe Company elevator in Hayfield were Charles Davidson, Bill Cameron, Bill Rathwell, Bill Porteous, Sweeney Bergeson, Bob Anderson and Curly Law. Baptists built Hayfield’s first church in 1910. The building included a baptism immersion tank and all the church furnishings. However, due to lack of Baptists, it became a Union Church in 1912 and served all denominations until 1925. Thereafter, the building became Hayfield Community Hall operated by a board of trustees consisting of Aaron Johnson, W. E. Lawson and William Cameron. The hall was used mainly for whist drives and dances. In 1957, the year the Dickie’s closed the store for good and left Hayfield, the hall building was sold by tender to Russell Cunningham who moved it to his farm. In 1929, Hayfield’s new rink opened. Surrounded by an 8-foot fence with a small opening on the east side for spectators, the rink was situated southwest of the store. A small shed accommodated skate changing. For many years, the rink was flooded by water tanked in from a spring north of Hayfield. Ron Sopp witched a well in 1940 just south of the store and thereafter, the well supplied rink water. A gas engine ran a lighting system for night skating and hockey games. Saturdays were a popular skating day. Sometimes hockey players spent the whole afternoon clearing the snow off the rink for a night game. Teams from Kemnay, Brandon, Beresford, Carroll, Roseland, Brandon Hills, Little Souris and Souris played hockey in Hayfield. The original builder and owner of Hayfield Store, A. Wilson, sold the business to another man named Wilson – J. B. Wilson who also owned Simmington’s Store in Brandon. J. B. hired Robert Scott to run the store. Scott eventually bought the store and ran it on his own for five years. The next owners were the E. C. Drury family who sold out to yet another Wilson – Mr. & Mrs. Vic Wilson who were proprietors longer than any other owners. Vic Wilson had an Imperial Oil dealership and sold International Harvester parts. Vic started the first mail delivery service for the Hayfield district in 1915, developing two routes. Mail was delivered using teams of horses. Wilson constructed a barn just north of the store to house the teams. The first mail carrier was T. Upton who was paid $600 a year for his services, which include four horses. Going the extra mile for customer service, on mail delivery days, area residents could phone the store with their grocery orders and have them delivered with their mail. Vic installed the hand-pumped gas bowser in front of the store. Other mail carriers over the decades were Vic Wilson, E. Lawson, W. Turner, Frank Beckett, Donald McCollum, Harold Rogers, Jack Davis, Alf Lovatt, Morley Lovatt, Bob Lovatt, Harold Brown, E. Canning, Wilmot McComb, Bruce Dickie and Lawrence Murphy. In the 1940s, the Wilsons sold the Hayfield store to Steve Kowilchuk who sold it to Mr. and Mrs. Ermine Canning in 1946. 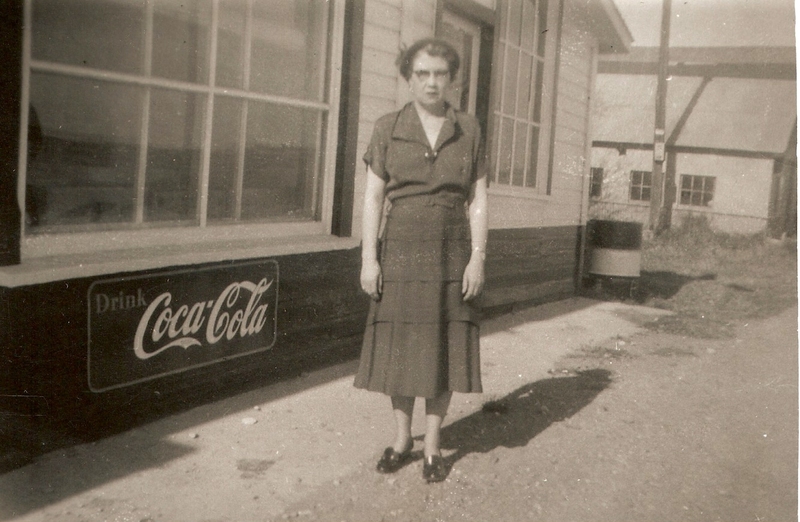 After Mr. Canning died, his widow sold the store to Bruce and Helen Dickie in 1952. Our family was the last to operate a store in Hayfield. In 1957, we held an auction sale to liquidate the stock and sold the building to Lawrence Murphy who continued to operate the post office and mail routes until January 8, 1968. The store had operated continuously for 51 years. Lawrence Murphy sold the property to Alice Magel and her son Mike in 1982. They occupied the place for a few years but by 1991 the building was vacant, its story almost over. Hayfield as it looked in the early 1990s, just before it disappeared. The store and the barn in Hayfield came to a sad but useful end in the 1990s when firefighters-in-training from Brandon and Souris used them for practice. They set the buildings on fire then put them out, set them on fire then put them out and so on until they were gone. All that remains of Hayfield today is a small bluff, a little patch of gravel and the elevation for the ¼-mile lane overgrown with grass, all surrounded by fields and pasture. The name remains in Hayfield Road as the sign on Highway #10 states. Once a home to hopes and dreams and a popular oasis for locals and travelers – it existed for almost 90 years – Hayfield has now vanished into memory. You can find my boyhood memories of living in Hayfield here and my experience attending a one-room schoolhouse here. 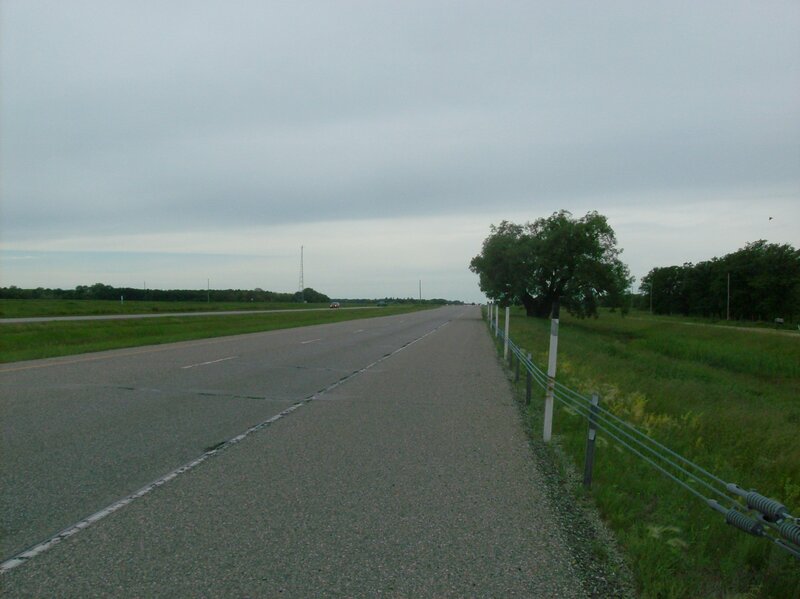 Regular, intercity travelers along the Trans Canada Highway between Brandon and Winnipeg will be familiar with the halfway trees, trees that local lore says mark the midpoint between the two cities. 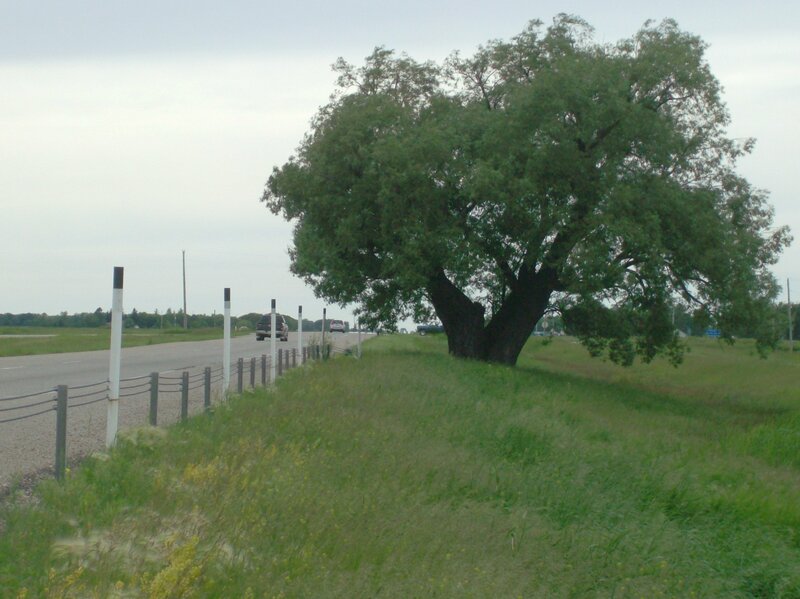 The halfway tree on the north side of the highway is about 14 kms west of Portage la Prairie, right next to the road and protected by a steel guard rail. This tree is a 40-foot common willow and is the last survivor of a willow planting next to a drainage swale. Twinning the TCH caused the other willows to be removed but this, the largest one, was spared. 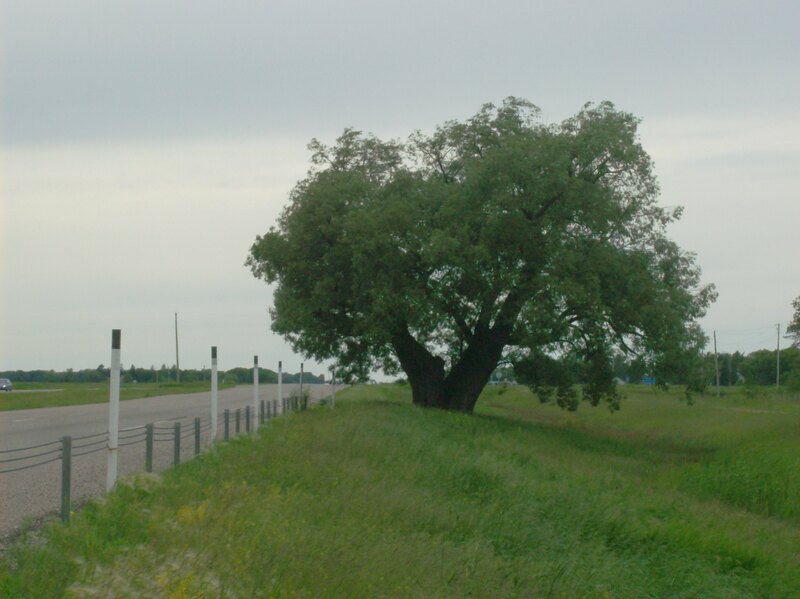 This tree is a Manitoba Heritage Tree and is listed prominently in Heritage Trees of Manitoba, a publication of the Manitoba Forestry Association. The other halfway tree, situated about 23 kms west of Portage on the south side of the TCH, is a gigantic, old cottonwood. This is the tree most recognized as halfway despite lacking heritage status. I have often seen the lower reaches of this tree decorated with an occasional Christmas ornament, ribbons, shoes and assorted stuff. It has been the scene of various life-changing events over its 100 year history including at least one marriage proposal. 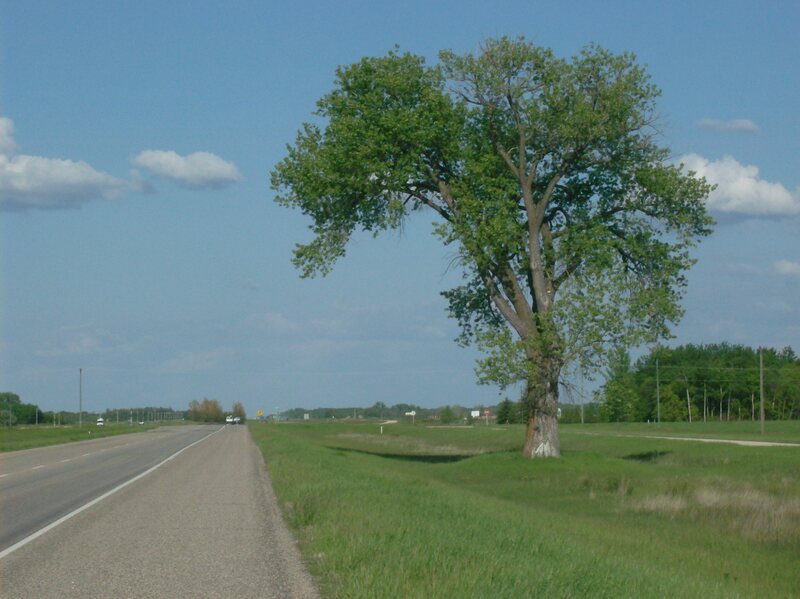 So we have two trees nine kms apart that both claim to be halfway between Winnipeg and Brandon. Fact is, neither tree is exactly halfway but, by actual miles, the cottonwood is closer to claiming that title than the willow. I suspect building the Portage bypass and twinning the TCH changed the mileage between the two cities, thus neither tree is pivotal. 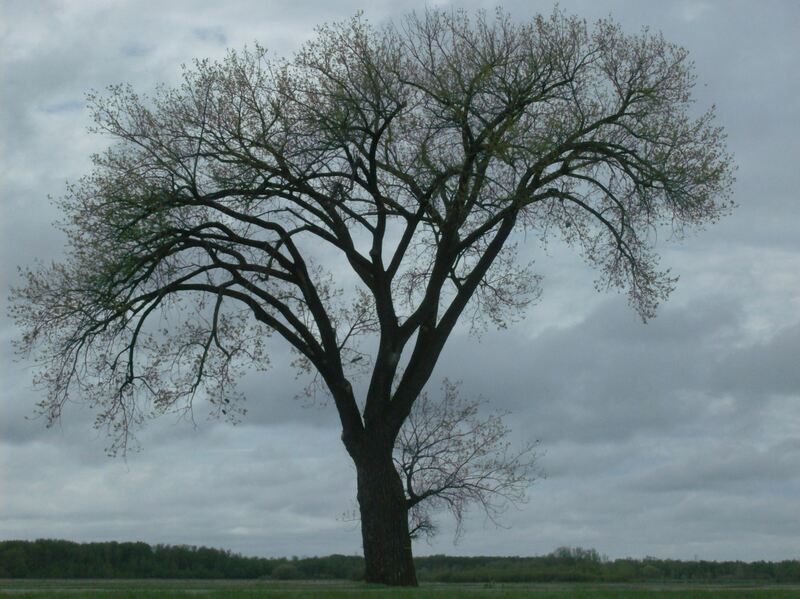 The cottonwood certainly merits heritage status and the Manitoba Forestry Association is taking nominations now to update the protected tree list. See their website for details on the process. 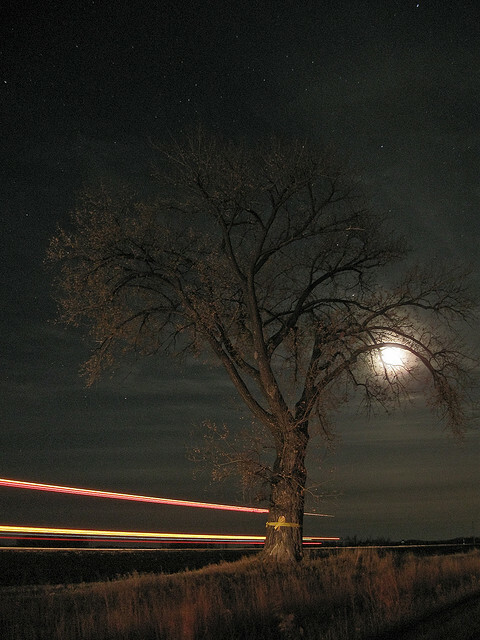 This moody photograph of the cottonwood at night was taken by Brandon photographer and videographer Derek Gunnlaugson. Thanks, Derek. Check out his website, Dex. Have someone stand next to the tree. (It doesn’t have to be a person but should be something of a specific height.) Holding a ruler vertically, walk backwards from the tree until the person is one inch tall on the ruler. Note where the top of the tree is on the ruler. Take that number and multiple it by the height of the person (or object) next to tree and you have the tree’s height. Easy! “Time to start building an ark,” said the elderly man ahead of me at the Hort’s this morning. Surveying the current situation, he may be right. Deluges of rain in the Souris River watershed over the weekend have already raised the river to dangerously high levels in Saskatchewan, where flash flooding has occurred, and North Dakota where the city of Minot has evacuated about 14,000 people. 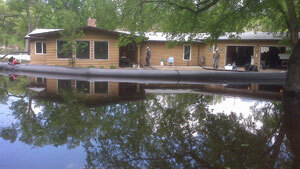 Twenty-six Saskatchewan communities have declared states of emergency due to flooding. That water now heads into Manitoba. 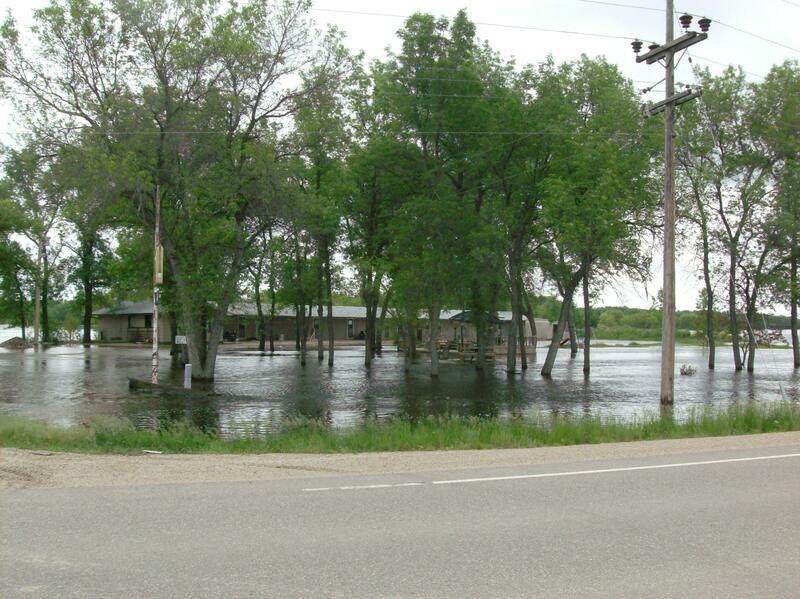 Its first hot spot is the town of Melita, already heavily diked against the flow. These pictures I took on Tuesday show Melita’s current water levels. Dikes around Melita will be bolstered against the new higher flows. Downstream the communities of Wawanesa and Souris are bracing for the new onslaught expected over the next three weeks. 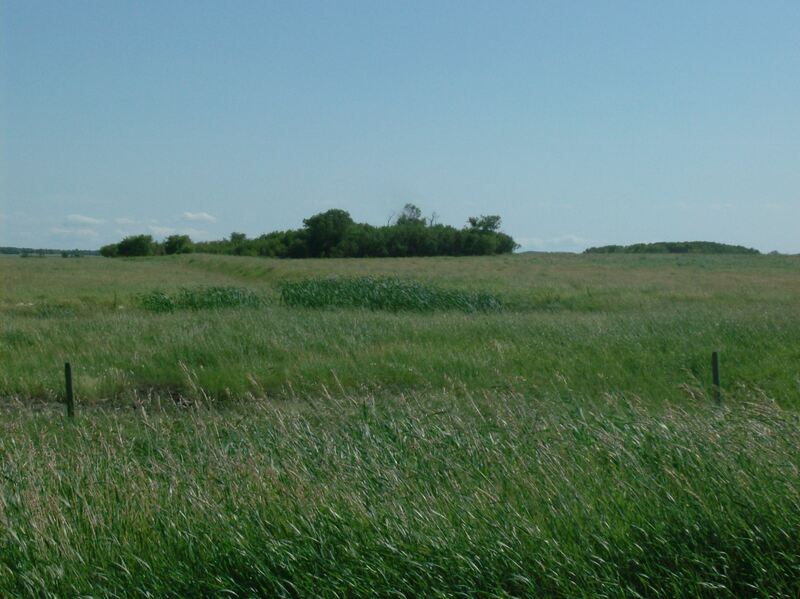 Existing dikes in Wawanesa will need come up eight feet to protect the town! The Souris River drains into the Assiniboine which will continue to be heavily diverted north into Lake Manitoba, exacerbating the flood problems around its shore. In the past couple of days, more evacuations have occurred around the lake in the RM of Siglunes, town of Alonsa and Lake Manitoba First Nations. 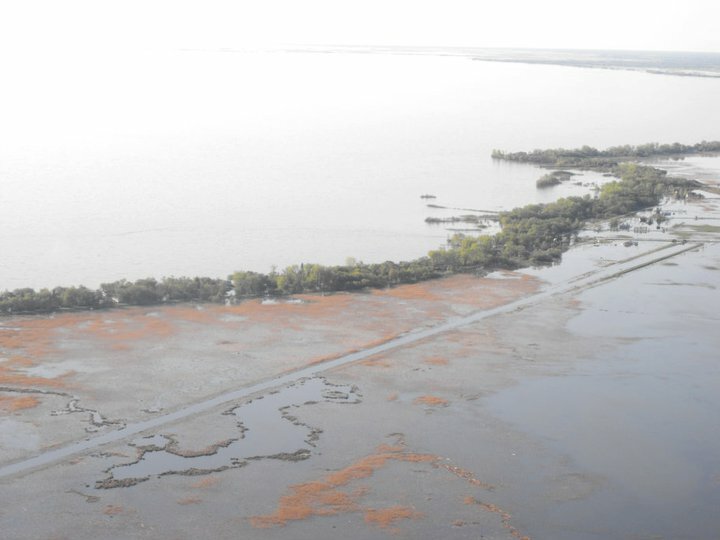 Watch a short video of flooding at Lake Manitoba Narrows. At this time, 2,649 Manitobans are evacuated from their homes. These pictures show more of the devastation at Twin Lakes Beach. The excessive rainfall has saturated the prairies. Total rainfall between April 1 to June 21 at many locations in Saskatchewan and Manitoba is approaching annual totals. For example, Weyburn, SK has received 82% of annual normal precipitation (342 mm), Melita 51 per cent (516 mm), Souris 65 per cent (518 mm) and Brandon 61 per cent (472 mm). It’s a sunny, muggy day in Manitoba today and similar in southeast Saskatchewan. However, more rain is ahead for the Souris River basin this weekend. There are currently 31 states of local emergency (SoLE) and five prevention orders. 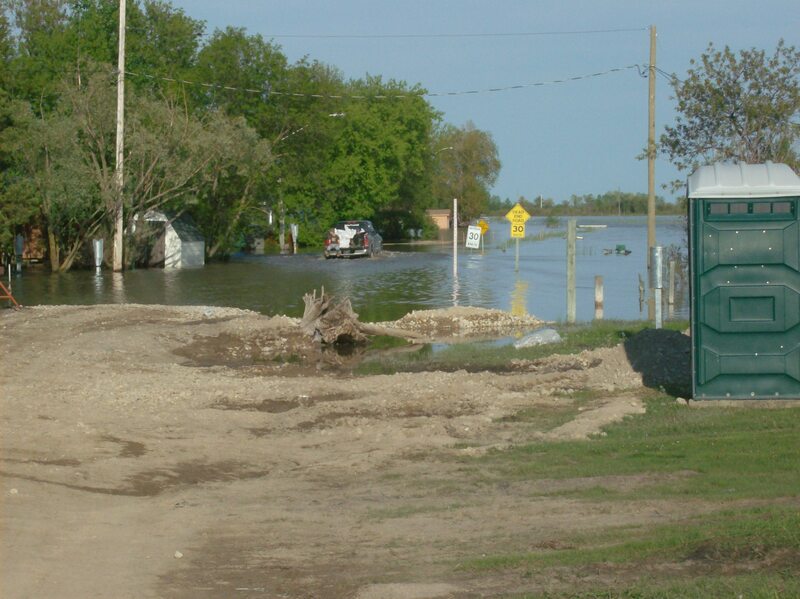 Since the Manitoba Emergency Co-ordination Centre opened in early April for spring flooding, there have been 67 SoLEs and 31 prevention orders declared across the province by local authorities. I took these next three pictures on Tuesday. 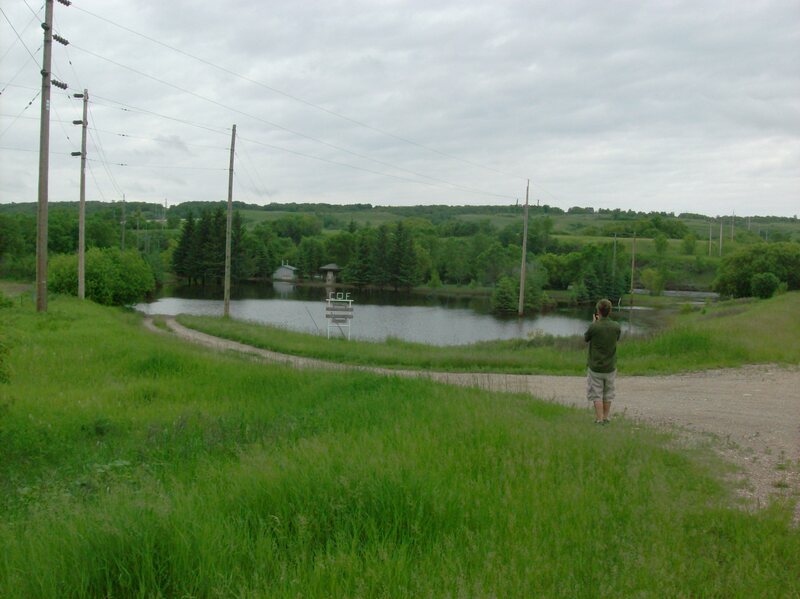 My friend Chris surveys inundated Riverside Park, where the Souris River crosses Hwy #10 south of Brandon. The Souris River flows toward an old bridge next to the park then the view downstream. The prairies remain vigilant for sudden flooding and unexpected rainfall amounts. I am working on an update about Spruce Woods Provincial Park for posting over the next two days. Keep your powder dry. Last Thursday I took a drive into rural Manitoba, destination Dauphin, to check out the aftermath of the torrential rains we received at the beginning of the week. There’s still water everywhere! I travelled out the Trans Canada Highway west from Winnipeg to Portage. At the TCH crossings of the Assiniboine River, the water was as high as it’s ever been this spring. 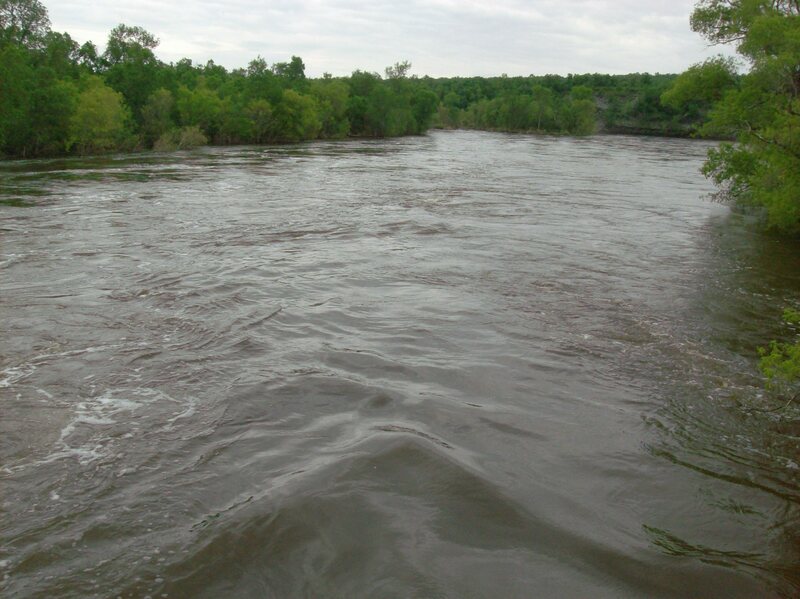 The Portage Diversion, carrying water from the Assiniboine into Lake Manitoba, was filled to the brim again. There appeared to be topping up activities along the dike. 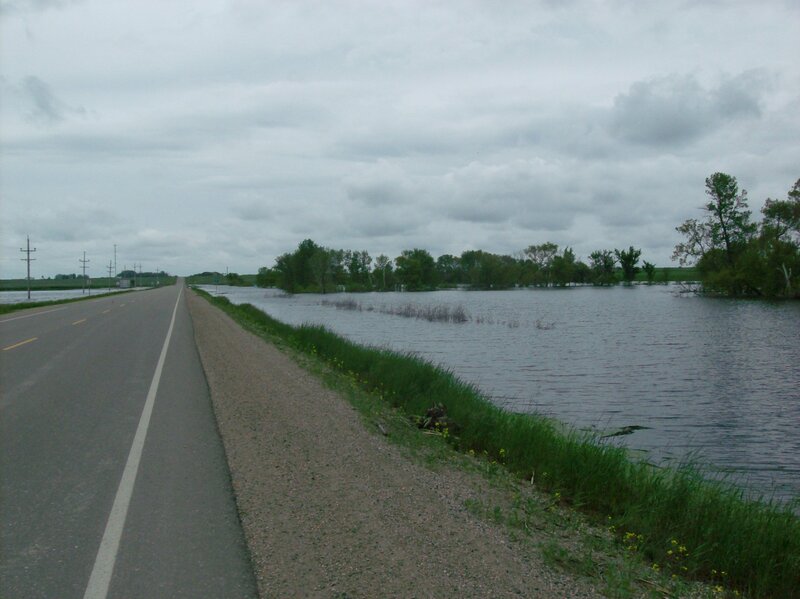 I turned onto Hwy #16 and didn’t encounter much new flooding until around Woodside, past Gladstone and almost into Neepawa, where the Whitemud River had spilled its banks. For miles and miles ditches and fields on both sides of the highway were flooded, as far as the eye could see in some places. The Whitemud drains the southeastern foothills of Riding Mountain, exactly where heavy rain fell Monday and Tuesday, causing flash flooding along its course. The earth here is already saturated, flash floods now more possible. This picture shows the brown murky water of the Whitemud, which has a distinct sewage odour, flooding the lower section of a rest stop on Hwy #16 before the Arden turnoff. Manitoba Water Stewardship (MWS) says the Whitemud will remain high until the runoff abates. I turned north in Hwy #5 along the east side of Riding Mountain, crossing many of the streams that feed the Whitemud. Most of them were full and fast flowing. As I passed Ste. Rose du Lac I could see their ring dike which they just recently reopened. That evening my cousin Vonda and I took a drive east of Dauphin to view the flooding around Dauphin Lake. 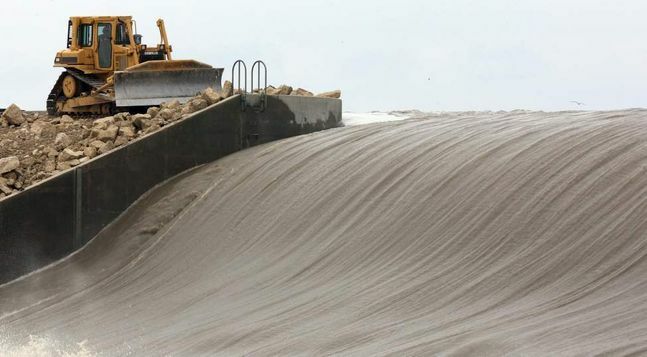 Dauphin Beach and Ochre Beach are inundated with many waterfront properties diked with heavy stones piled along the beach to protect their property from wave erosion. 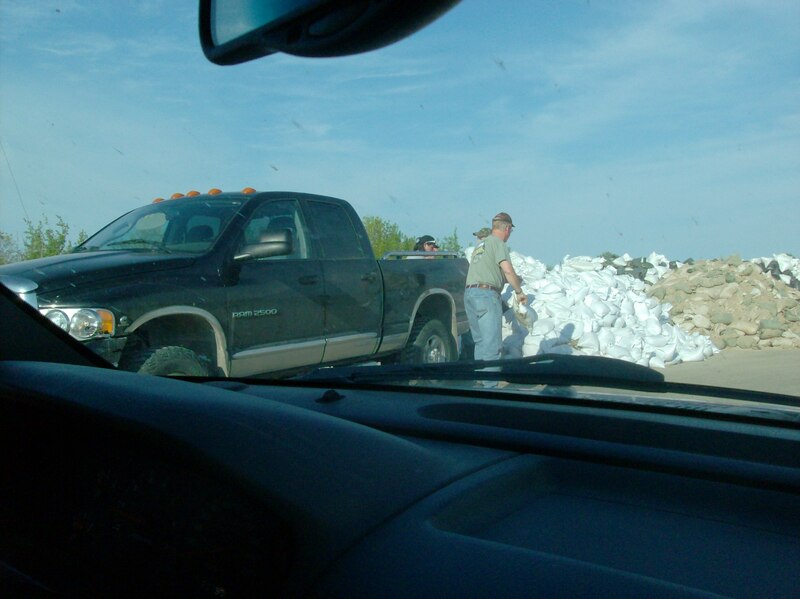 Many properties were flooded, sandbags were available at several locations and people were busy hauling them away. The worst areas are Ochre Beach and Crescent Cove. 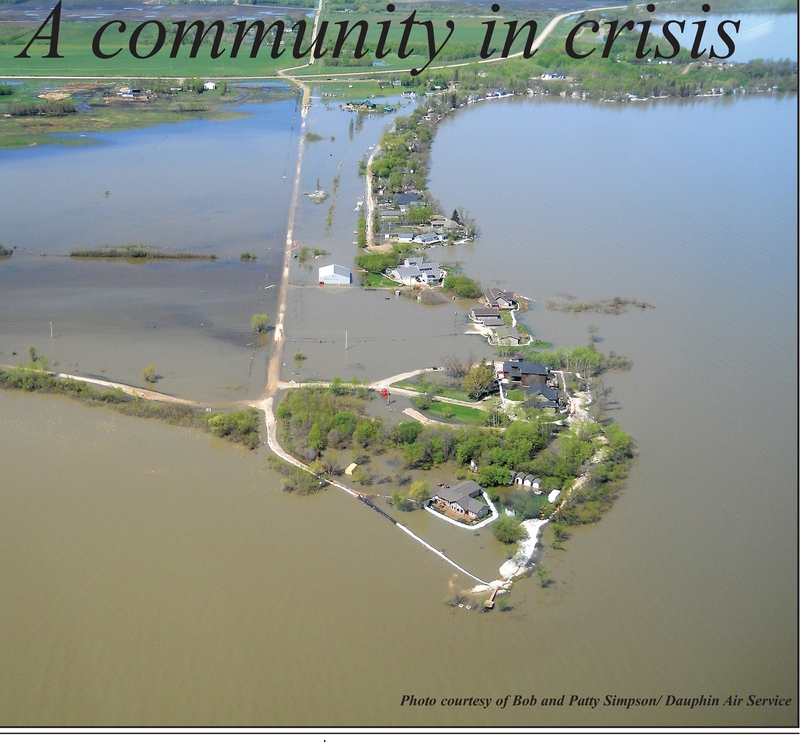 The picture above is an aerial view of Crescent Cove on Dauphin Lake that appeared on the front of this week’s Dauphin Herald. The other pictures are ones I took of Dauphin Beach and Ochre Beach and show water levels that are still high but have subsided from the storm earlier in the week. Click to enlarge any picture. Yesterday (Friday) I drove home through Riding Mountain National Park where I spotted deer, a coyote and a moose lifting its dripping head out of the swamp water with a mouth full of water weeds, a classic Hinterland Who’s Who moment. 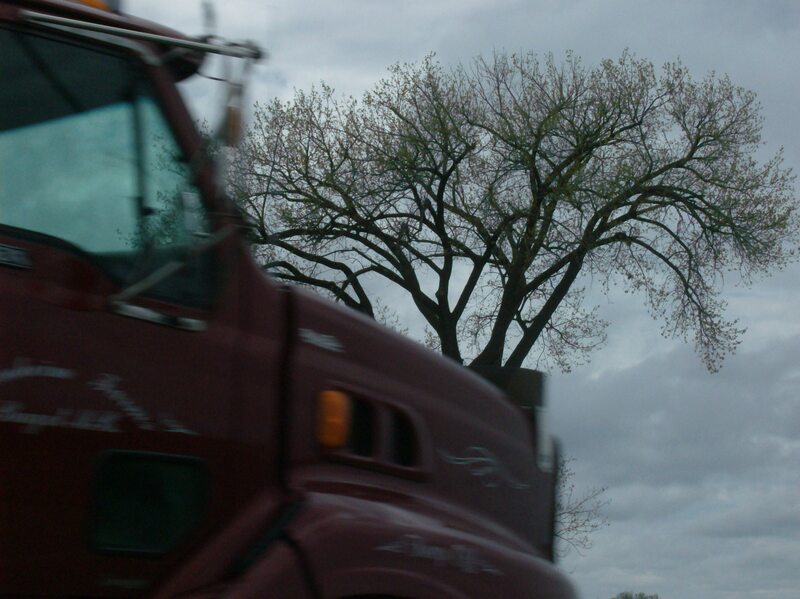 Trucks three axles or more cannot travel the highway through the park due to some soft road conditions. Overall, it’s still a pleasant and easy drive through a beautiful lush forest. My next encounter with flood water was in the valley of the Little Saskatchewan River south of Erickson. Some of the fields were still flooded and the river hurtled along filled to the brink. The same river flows through Minnedosa which was diked in several areas. I drove south to Brandon and surveyed their situation. First and Eighteenth Streets are open and still thoroughly diked to about twelve feet. 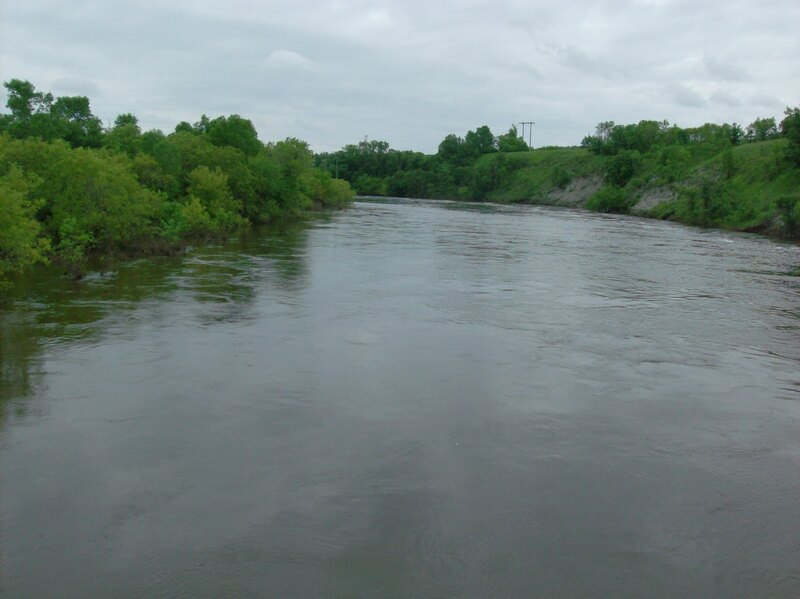 The water has receded in some areas around Brandon but a new crest of the Assiniboine is expected this week, returning the river to its record highs of a month ago. As they await the next crest, towns and cities all along the Assiniboine from St. Lazare to Winnipeg are on tenterhooks. The town of Souris has declared a local state of emergency and sandbaggers are working day and night against the Souris River. In this picture a Souris family prepares to leave their diked home as the flood waters rise. Wawanesa is under the same conditions though MWS says the Assiniboine is now cresting in both those towns. More rain is expected early next week so they remain on alert. See NASA’s view of Souris River flooding. The place least worried about this is Winnipeg. If the Assiniboine gets too high, ‘Magic’ Duff Selinger, Manitoba’s unelected premier, has promised to open Hoop and Holler Bend again to relieve the nasty river of a few hundred cubic feet of water per second so he can don his Moses outfit and blink and grin again. This man is so dumb he thinks this cynical ploy will work twice on Manitobans. We got it the first time – it was a fake-out, a publicity stunt. This time there is more at stake. 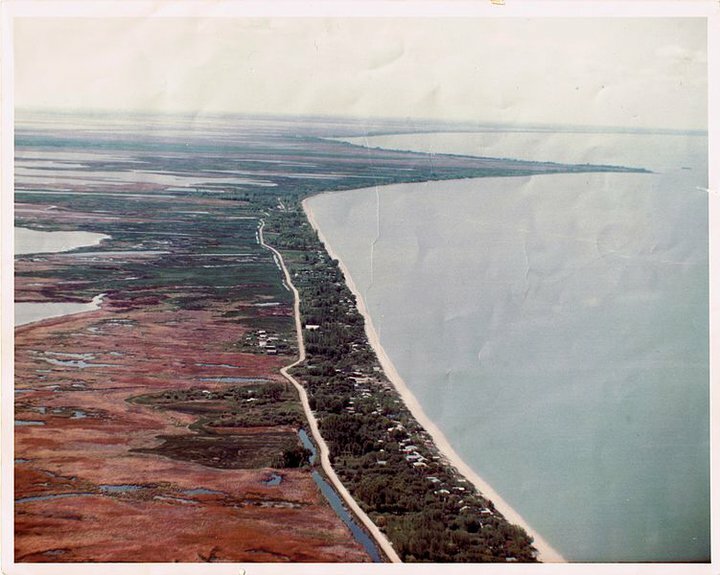 The government has bungled Lake Manitoba water management so badly this year, both with the actual level of the lake and dealing with the tragic human aftermath of man-made flooding, they need a saviour move at Hoop and Holler Bend to divert attention away from their big mistakes on the big lake. MWS reported yesterday the Fairford River outlet from Lake Manitoba is flowing at its highest level ever. Grain of salt, folks. I just can’t believe what these people say any longer. 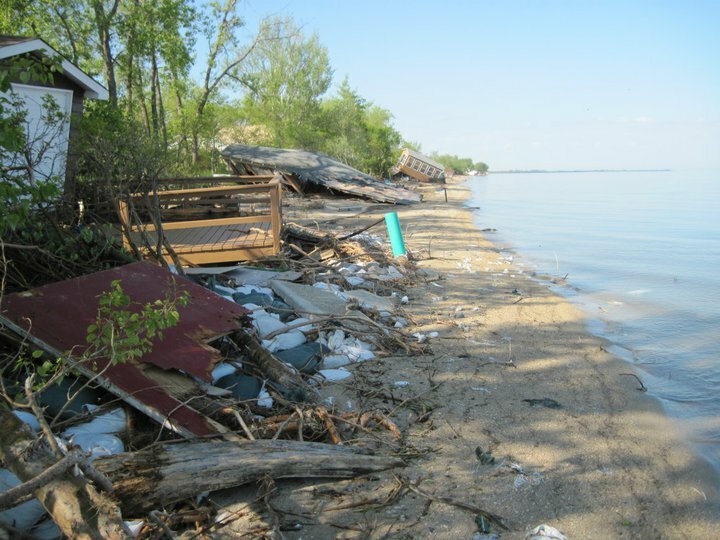 The above After picture is of Twin Lakes Beach on Lake Manitoba after recent devastation from high water and winds. Compare it to this Before picture from the 1980s. It’s becoming the flood that never ends. Build an ark people, build an ark. Get a grant or maybe even a buyout after the flood from the province to build it. Which reminds me the widely touted parting of the Red River by Moses Selinger has been moved off the back burner, I hear. Stay tuned. That’s the best news! This map illustrates the normal amounts of rainfall Manitoba usually gets in May and the excessive accumulations this year. The following list shows how much more rain the area has received compared to normal amounts for May. Souris, Estevan, Sask. and Minot, N.D., have received 297 per cent of normal precipitation. Hamiota has received 294 per cent of normal precipitation. Pierson has received 279 per cent of normal precipitation. Ste. Rose du Lac has received 254 per cent of normal precipitation. Virden has received 250 per cent of normal precipitation. McCreary has received 246 per cent of normal precipitation. Melita has received 229 per cent of normal precipitation. Dauphin and Arborg have received 195 per cent of normal precipitation. Brandon has received 190 per cent of normal precipitation. Portage la Prairie has received 182 per cent of normal precipitation. So far, our spring has been cool and wet with a few summery days. Soils province-wide are saturated causing concern about flash flooding should we get more heavy rains. Fields and pastures remain underwater with farmers saying the land will be useless for years, residents along Lake Manitoba are demanding government buy-outs of their flooded properties, Dauphin Lake claims more and more properties, new crests of the Souris, Qu’ Appelle and Assiniboine Rivers are coming and emergency crews continue watching miles of dikes for breaches. Regarding the buy-outs, The Magnificent Selinger has flip-flopped on this, one day, no buy-outs, next day maybe buy-outs, then some buy-outs. Still pretty tense here. Bartley Kives wrote an interesting piece about our lakes in the Brandon Sun. Best lead line this week is from Bill Redekop: “One cottage had seaweed clinging to the ceiling fan.” Sad, poignant and descriptive – good one, Bill! Provincial parks are either blossoming or bombing this year depending on their flood status. 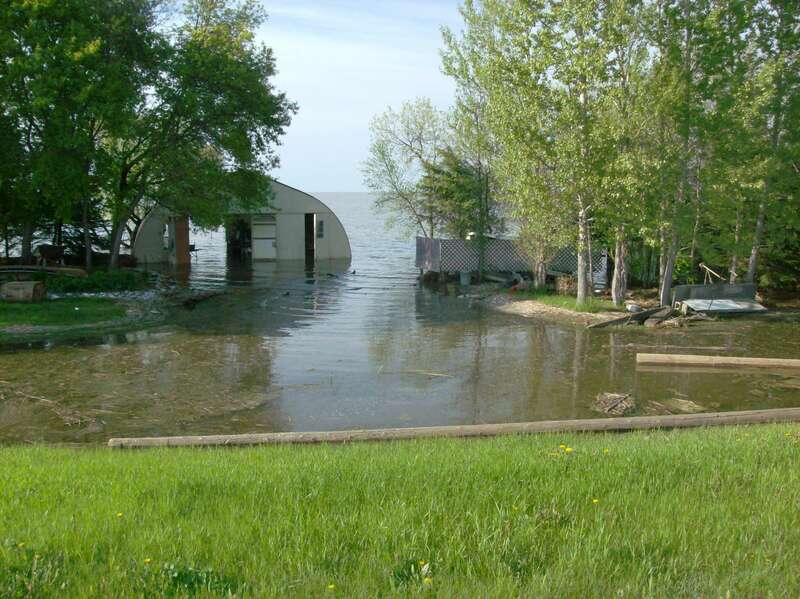 Three campgrounds around Lake Manitoba have been inundated and are closed for the season: Lundar Beach, St. Ambroise and Watchorn. 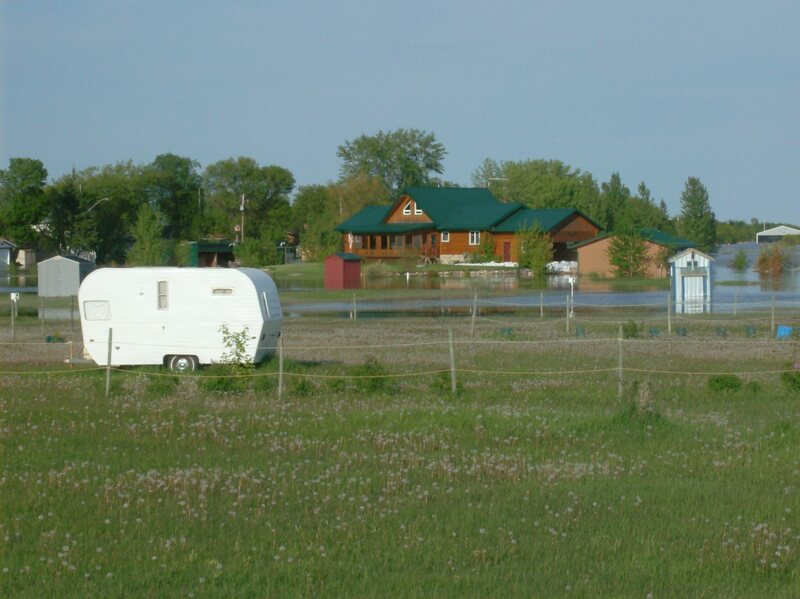 Due to spring flooding and increases in lake levels for the next several months, these three provincial park campgrounds will not open this season and efforts are underway to protect park infrastructure. 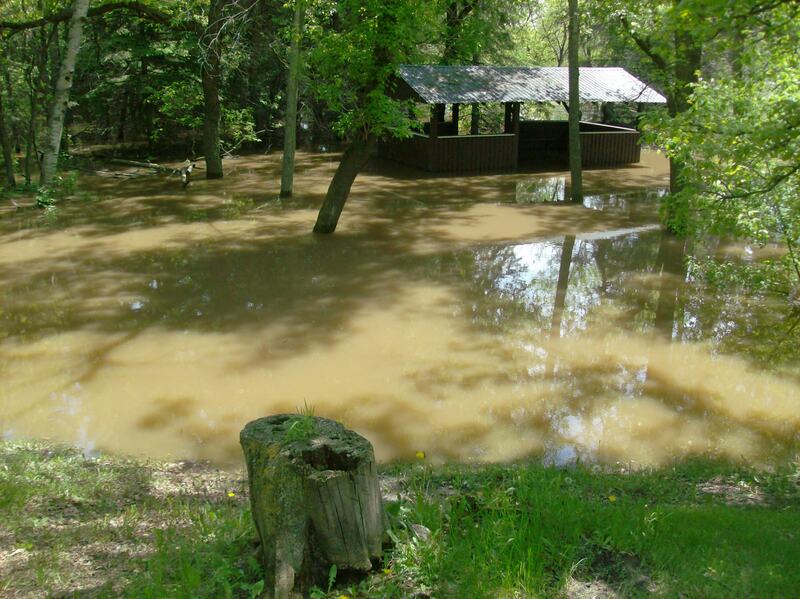 Spruce Woods Park remains off-limits and inaccessible except for the higher campground. The provincial parks website has the latest information. 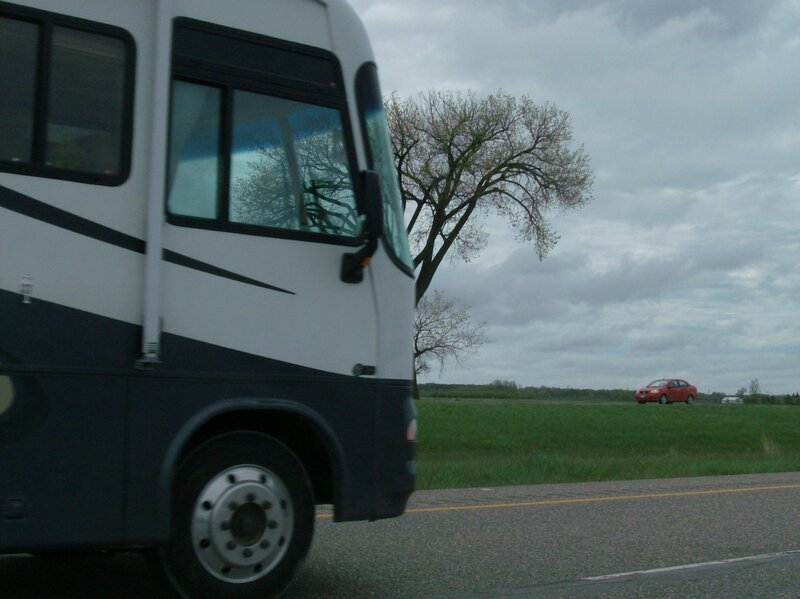 A reminder: for the third year in a row there is no charge to visit Manitoba’s provincial parks, free admittance but campground fees still apply. Get out there and enjoy one of our parks. Last Monday, when I was driving back from Brandon in the heavy rainstorm, I had a touching and reassuring experience along the road that needs telling before I forget it. I used #2 Highway to come back to Winnipeg and thought I had enough gas when I left the Wheat City. I stopped in Glenboro to let a deluge pass and meant to get some gas there, however, forgot. Seems the bottom half of the Avenger’s tank empties quicker than the top! My gas gauge sat at empty about 40 km outside Winnipeg and though the diagnostic menu said I had 88 km to empty, I didn’t believe it because the little gas pump symbol was lit, too. I pulled into Starbuck, MB about 6:40 expecting little in the way of an open gas station. They have a Co-Op cardlock but I’m not a member. The rain had let up and as I stood there pondering my next move, a little yellow sports car pulled into the lot. ‘Not from around here. Needs gas too,’ I thought, correctly. His car spelled out in big letters LOW FUEL. My plan was to pop over to the local hotel and see if any of the boys bending a few might have a Co-Op card and the friendlies to help out a stranger in need. The yellow sports car guy and his girlfriend, also Winnipeg-bound, were sceptical about my plan but I said, ‘Wait here, I’ll be right back.’ I drove the block and a half to the Starbuck Hotel, a fine establishment where I explained my plight to Lorelei who gladly asked the pub boys about cardlock. None of them had one. ”No problem,” she said. ”My dad has one and he lives in town.” Lorelei called her dad, explained the situation and told me to meet him at the Co-Op. His name is Len. I thanked her profusely and drove back to the pumps. As I expected, the yellow sports car was gone. Two minutes later, Len pulls up in his half ton, all friendly and smiling. We chat about how much we don’t need the rain as he pumps $15 worth of regular into the Avenger. I give him a twenty and he reaches for change but I tell him to buy his buddies coffee in the morning on me. I thank him for coming to my rescue. He drove away in his half ton, feeling good because he helped a stranger in need. I drove away in my Avenger, feeling quickened by the benevolence of the human spirit and grateful I grew up in a small town. Thank you, Lorelei. Thank you, Len. Thank you, Starbuck. 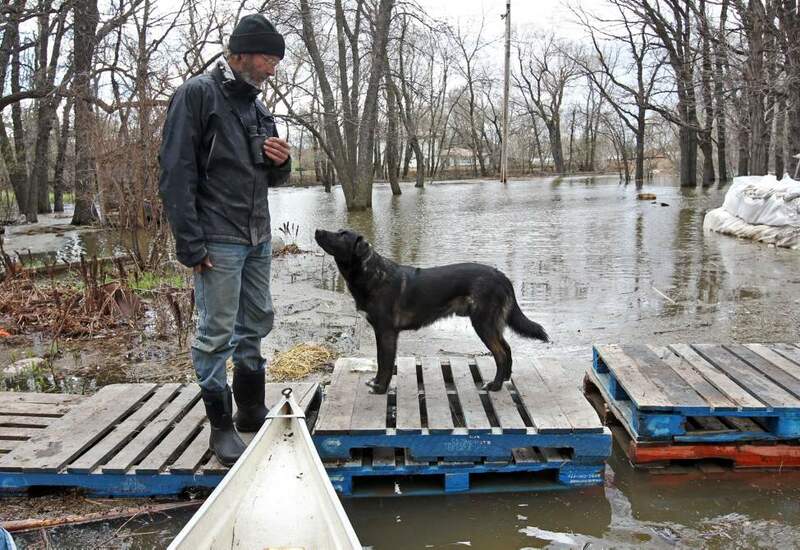 Dave Barnes, with his dog Jack, looks over the expanse of flood water covering his property in Brandon’s east-end. 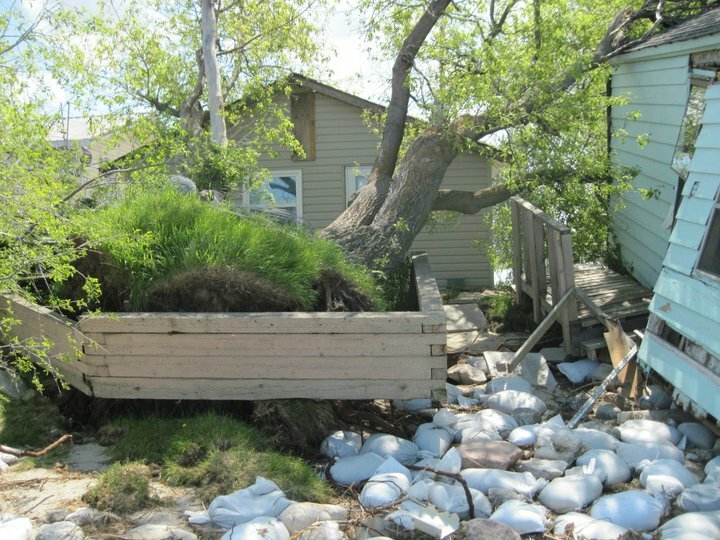 Friends and volunteers helped Barnes surround his home with sandbags and protect it from the surging Assiniboine River. This poignant photo of dog and master sharing an anxious moment was taken by Brandon Sun photog Colin Corneau on May 11, 2011. I highly recommend Colin’s fascinating collection of black and white Brandon photographs here.